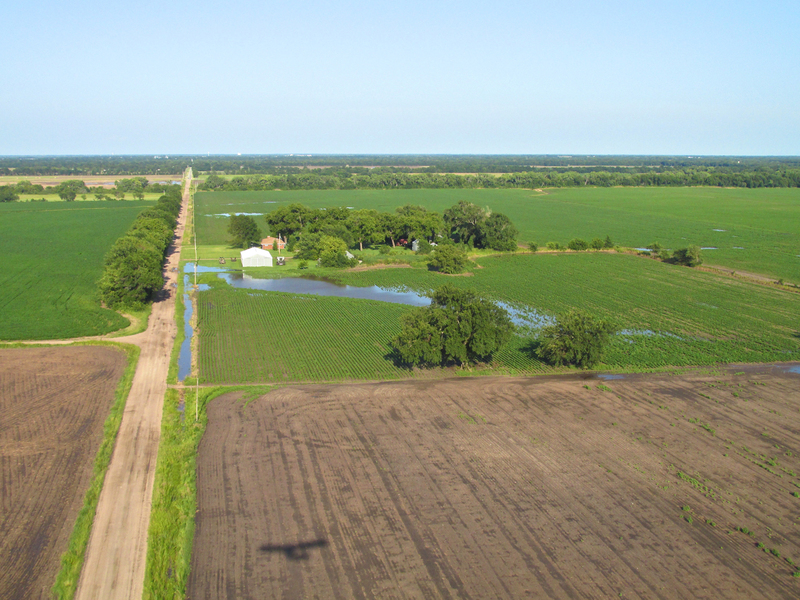 Although an increase in my Advertising Business had been a factor that Spring and Summer, the rainy conditions were most to blame for keeping me grounded. While a different context for me than for a youngster, “being grounded” produces a similar result – anxiety, discomfort and a longing to break the bonds of earth. Mr. Surf saw the potential of a flying season being washed away! This put him on edge and ready to risk getting a little wet rather than remaining confined to the ground. I have flown through light sprinkling rain many times. While it is not my favorite thing to do (it feels like being pelted by tiny BBs), light sprinkling rain typically does not last long in this area and you get through it pretty quick. 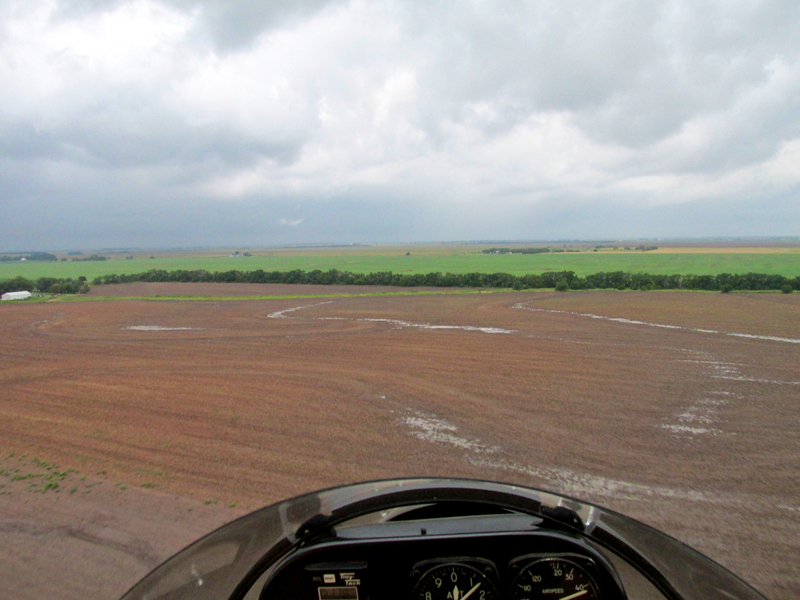 Out here on The Great Plains, when airborne, if the visibility is good you can see rain many miles away. 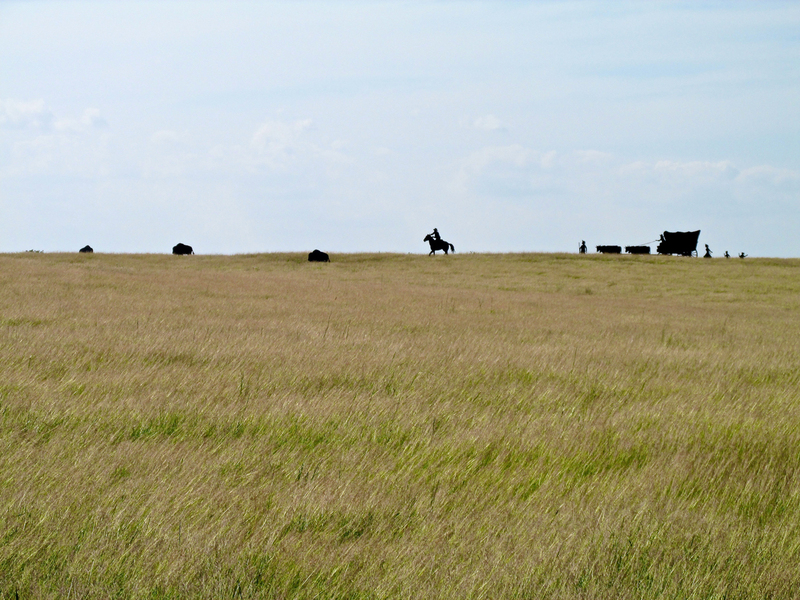 Here is a photo I took as part of a Sky Safari to beautiful Eureka, Kansas that makes an excellent illustration of this. In that case I was heading away from the downpour. If it had been in my path, I would have landed. 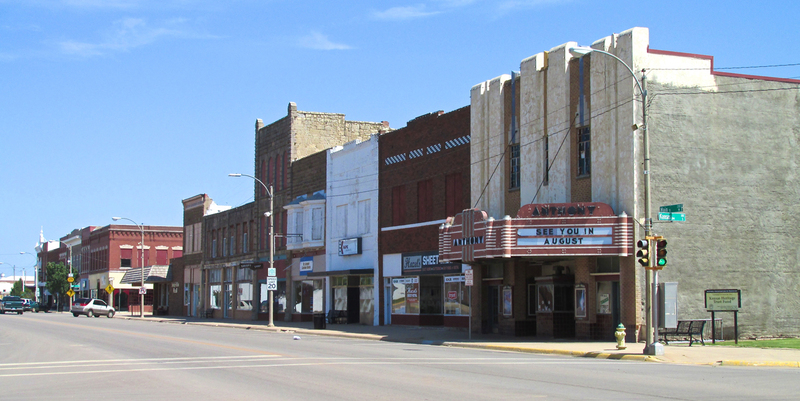 I had been monitoring different weather reports up to the Saturday of the flight to Anthony, Kansas. The pointers were indeterminate. Friday night I decided to head out early Saturday morning and conduct a “visual” at the field and decide whether “to be or not to be”. Looking Southwest in the direction of my goal (Anthony), it appeared to be as forbidding as the weather Northeast. What caught my attention, though, was the “brightness breakthrough” dead center in the picture at the horizon. That morning the wind was coming directly from that spot. To me, that meant better skies were on the way . I decided I would get airborne and then from that better vantage point be able to see what things looked like “Anthony-wise”. 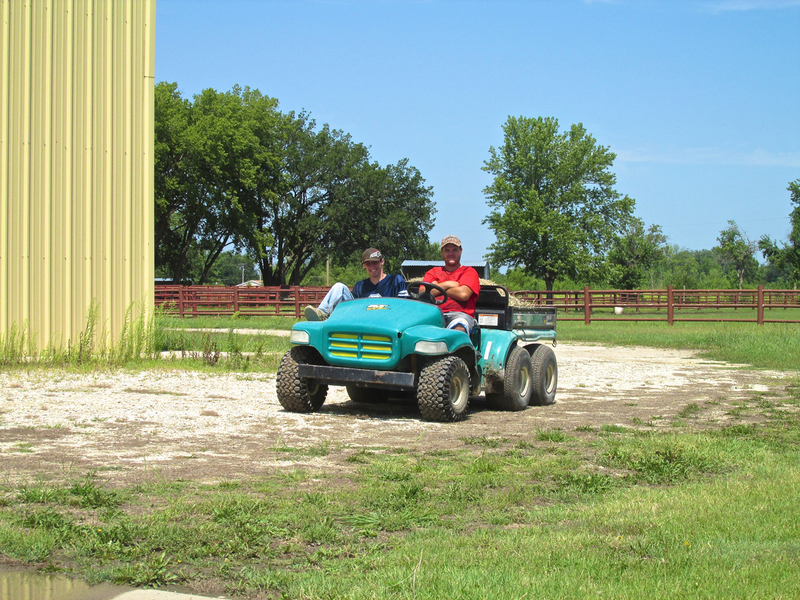 Paul White, the owner of the new “Blue Sky Stables & Aerodrome“. As I was contemplating the skies, Paul White came around the corner on his 6-wheeler. 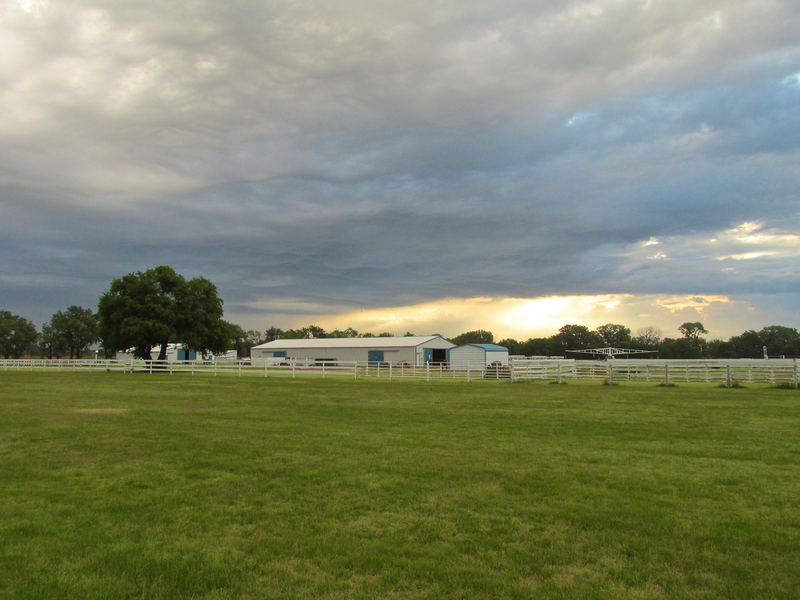 Paul, originally from Texas, and his wife recently bought the Selby Stables and have renamed the property “Blue Sky Stables & Aerodrome“. He knows a lot about horses and intends to learn all he can about airplanes. Long before Paul bought the place he was reading The Flite Blog™ so he knows of The Sky Surfer’s journeys. When he first came around the building, I was out in the middle of the runway getting a better view of the sky to the Southwest. I walked over to confer with him as to what he might know about the weather forecast. Neither of us had heard any thunder and it had not rained since the middle of the night before. I told him it was my plan to get airborne so I could see better ahead and then decide. He agreed my plan was worth a try. I told him I might be back soon or he wouldn’t see me until late afternoon. He watched my take off. At first the journey had possibilities. Although the ceiling was low, I could see into the distance and there was no rain. After about 10 minutes, rain began falling in the distance. I turned around, returned to Blue Sky and landed. On the final stretch to the field, light rain began to give me the “bb treatment”. 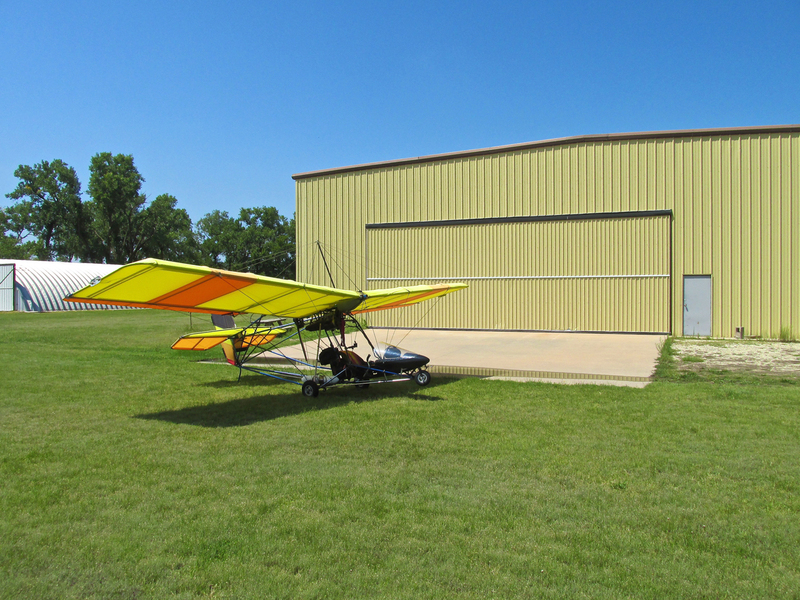 No sooner had I pulled the airplane into the hanger and a short downpour ensued. Even though the rain had scrubbed my initial foray I knew from the web radar it would not last. I drove home to get some work done in my home office, all the while checking the radar on my computer to see how soon it would clear up. After a while I became focused on some task and stopped checking the weather. When I went upstairs for more coffee I was delightfully surprised to see a sunny sky outside. I raced downstairs, shut down the workstation, jumped in the Mini and headed back to Blue Sky Aerodrome. 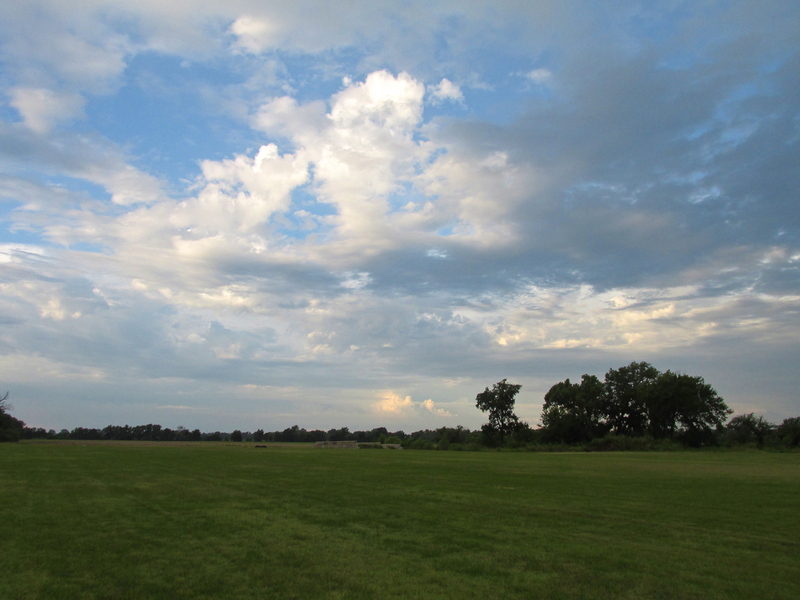 The sky was blue and the field relatively dry. Since the airplane was already pre-flighted, I just topped off the fuel tank and pulled it out. This time Blue Sky Aerodrome was represented by Paul’s Son Corbin. He and his buddy saw me drive my Cooper back to the hangar. By the time they hopped on the 6-wheeler, I had the engine idling and was just about to step into the cockpit. I motioned to them to pose for the shot below, gave them the “thumbs up”, hopped into the plane, taxied to the active and hit the skies. It is amazing what a couple of hours can make in the weather of Kansas. 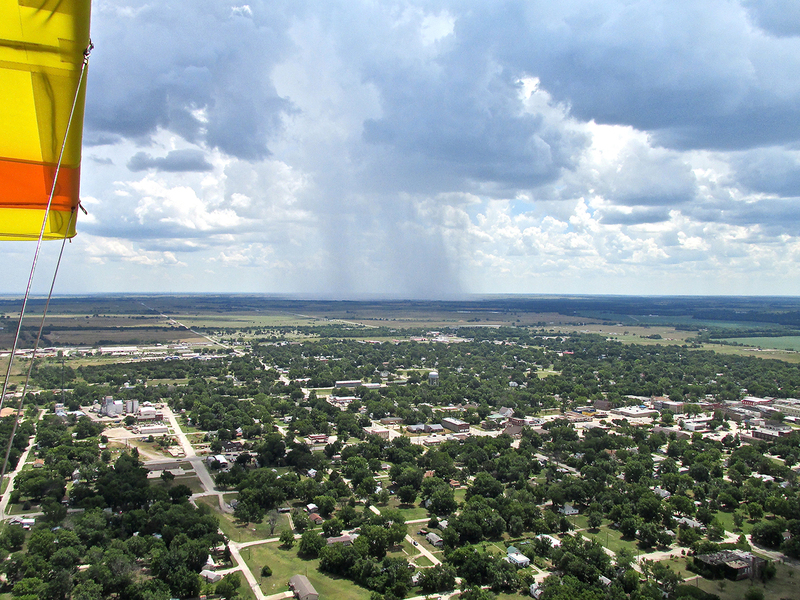 This was taken just after takeoff looking Southwest from 500′ AGL. No longer overcast, the winds are light. 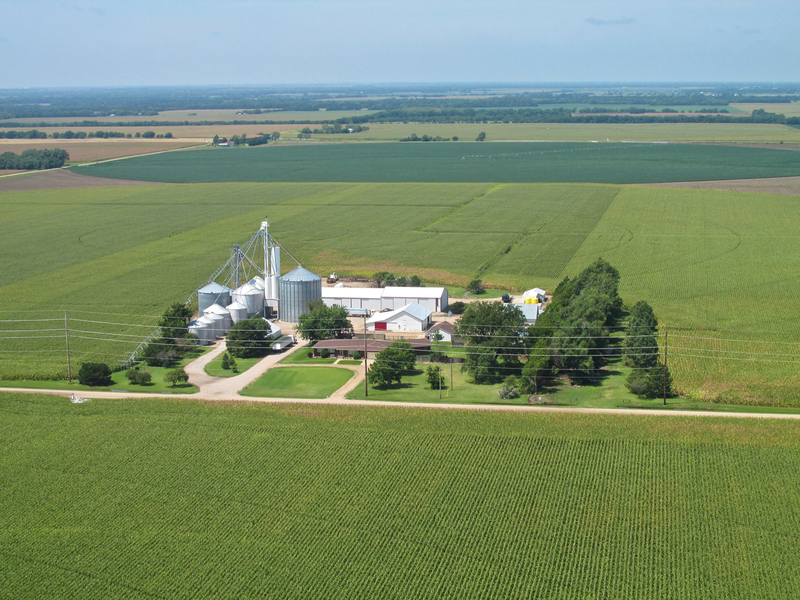 An attractive farmstead floating in a sea of corn not more than 3 miles Southwest from Blue Sky Aerodrome. 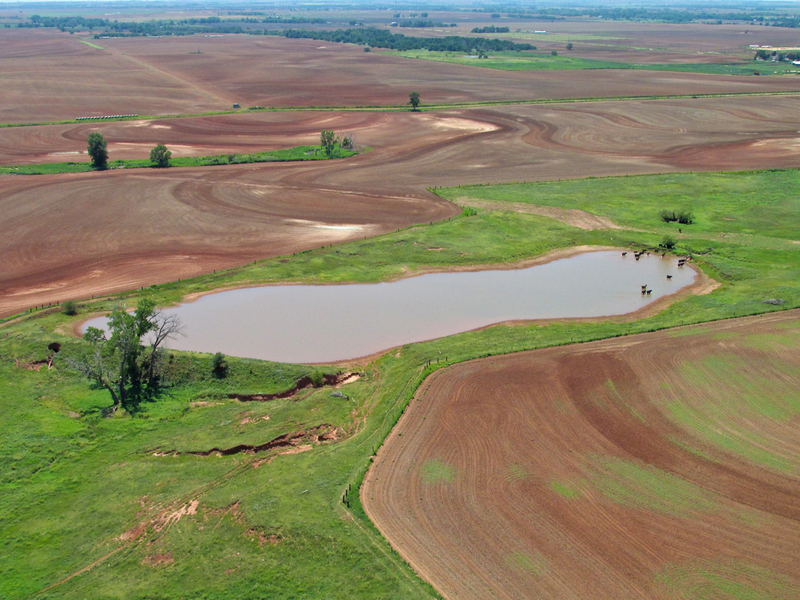 As in a lot of places, water is a precious commodity in Kansas. Except for the floods in the Kansas City Area over a decade ago, we welcome all the rain we get. The problem is holding on to it. 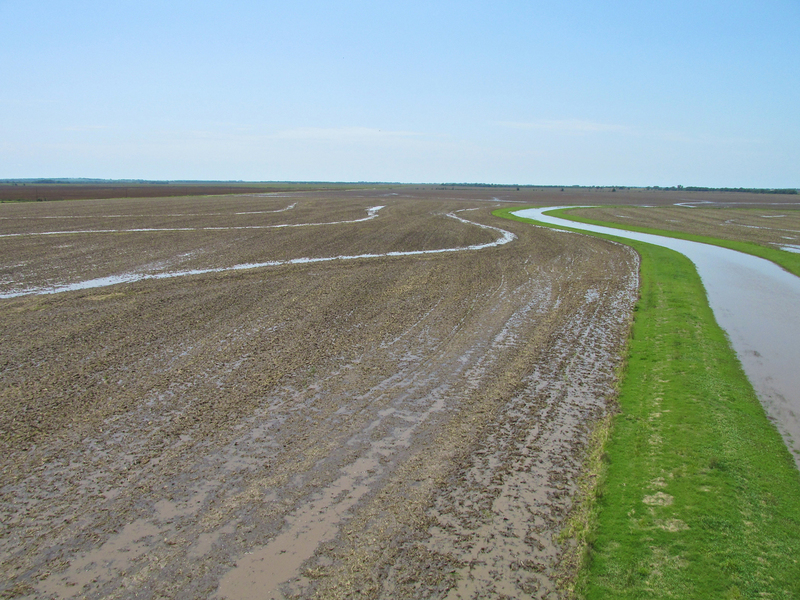 Most of it joins the rivers and ends up in The Gulf of Mexico. 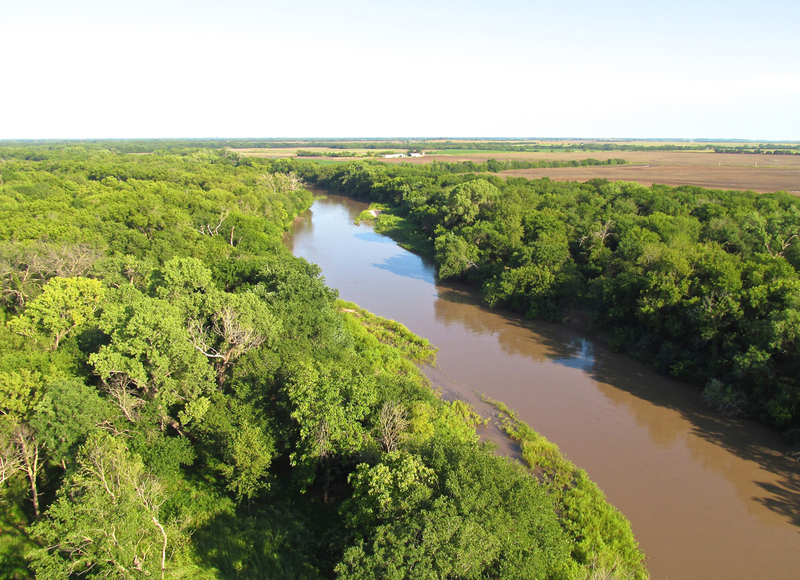 There is a scheme to replenish the aquifer that the city of Wichita has undertaken but thus far the project doesn’t seem to be living up to expectations. 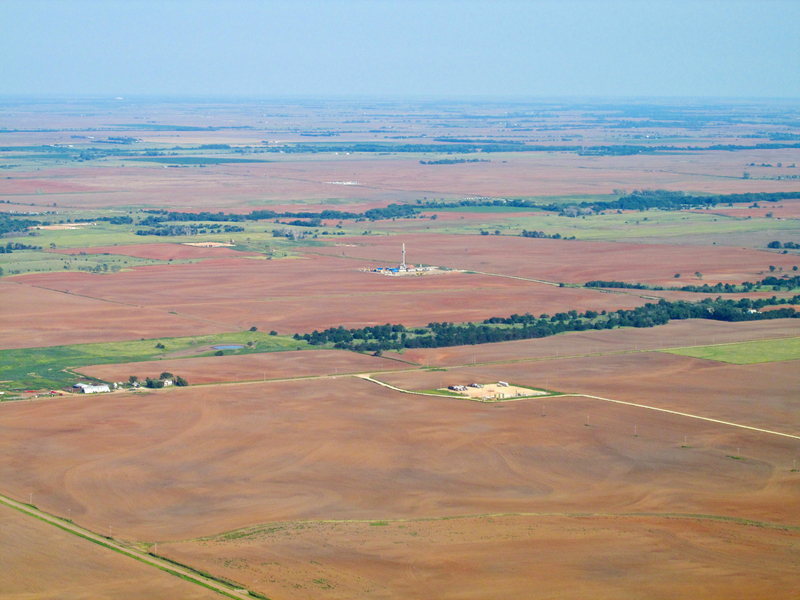 Enterprise On The Plains: A Cup Half Full Or Half Empty? 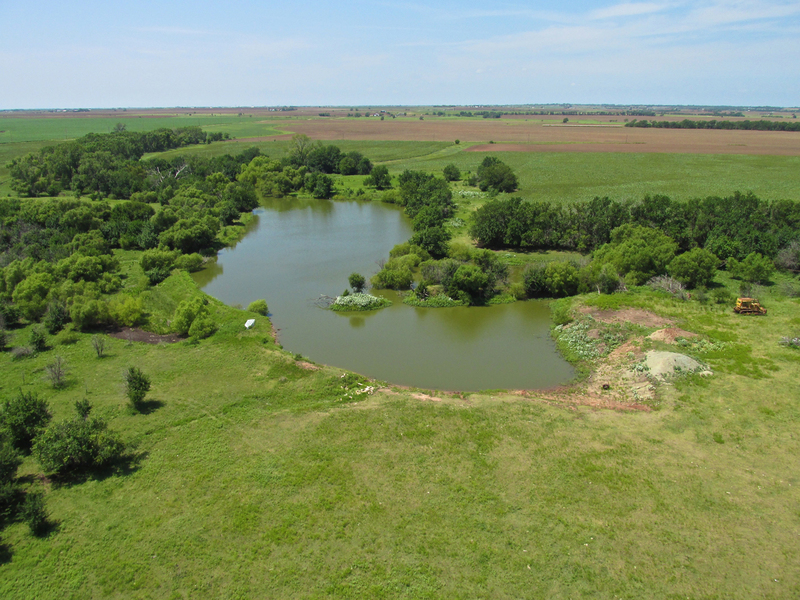 Below, the casual eye might only see an attractive pond in a bucolic setting. But as I said earlier, I remember this area three years ago in the middle of a burning drought. At that time all the ponds of this type were empty – dry. 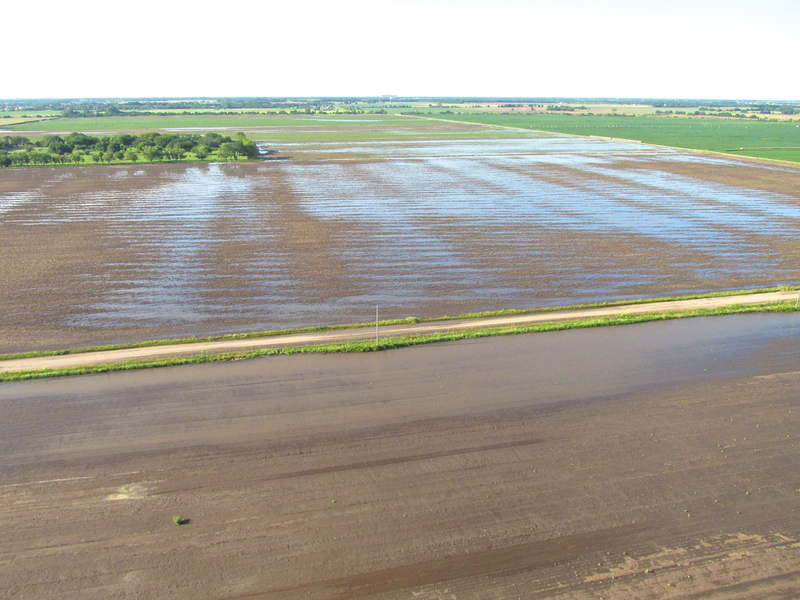 Farmers around the region made the best of a bad situation. While the ponds were dry, they brought out the bulldozers and tractors with blades and deepened the ponds. 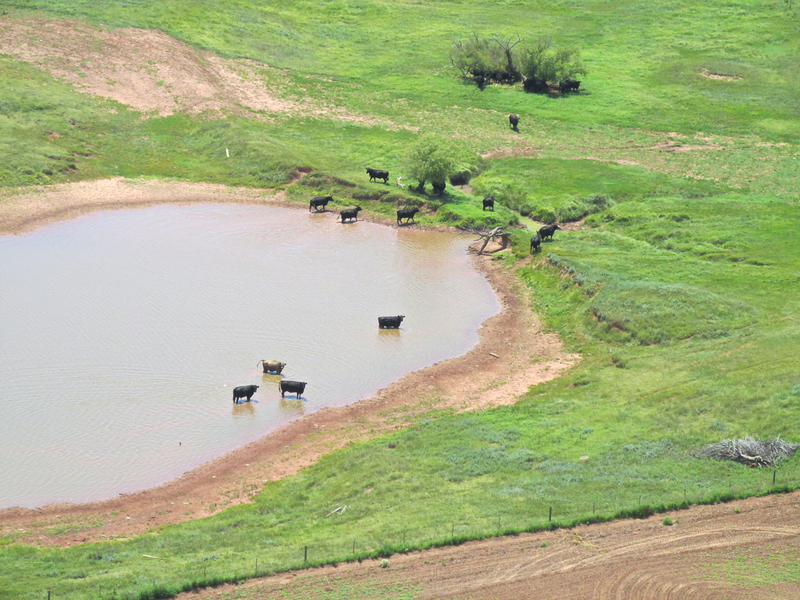 Now, three years later, the rains have returned and the deepened ponds are holding more water than before the drought. 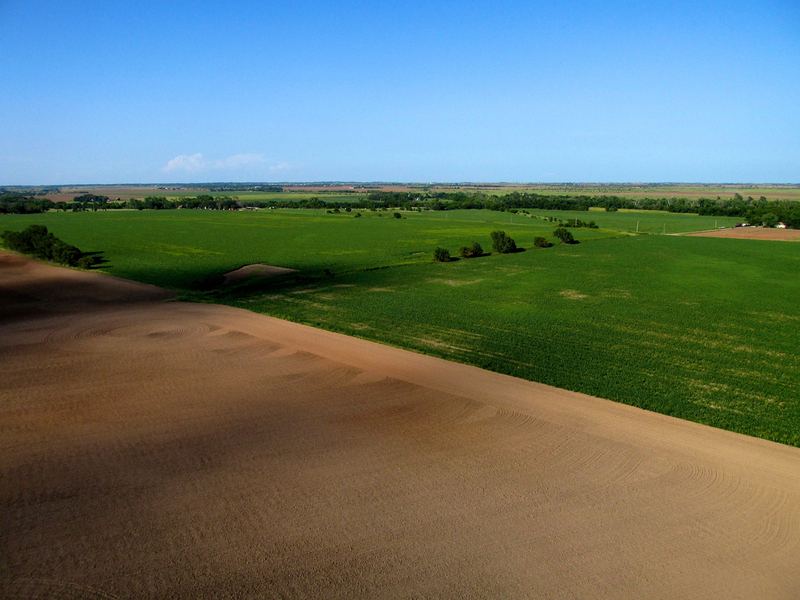 I have passed this small sand dune area many times when flying Southwest of my home field. 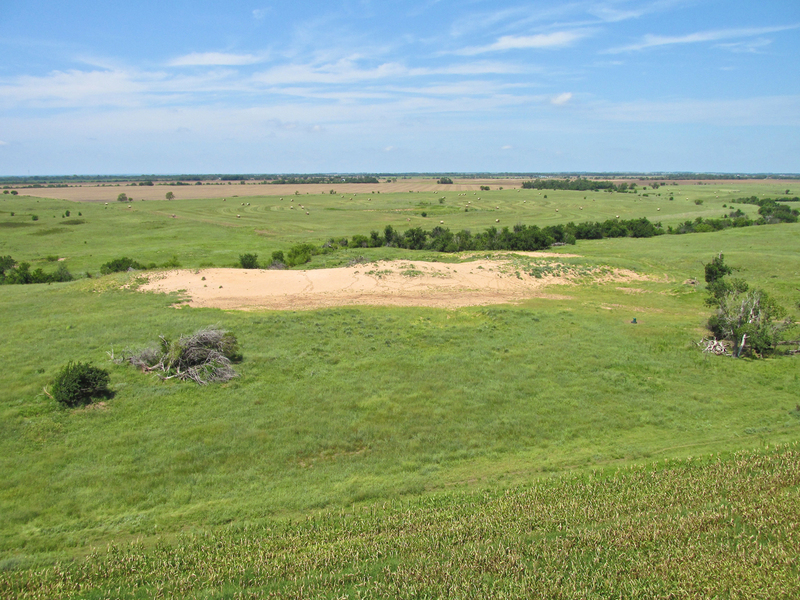 It is the only patch of sand for miles and makes quite a contrast to the surroundings. 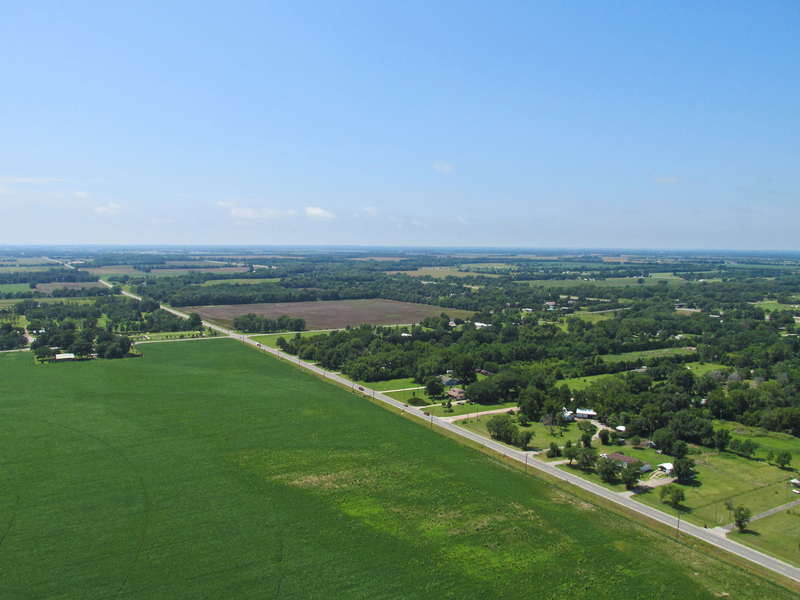 Approaching Argonia, Kansas from the Northeast. 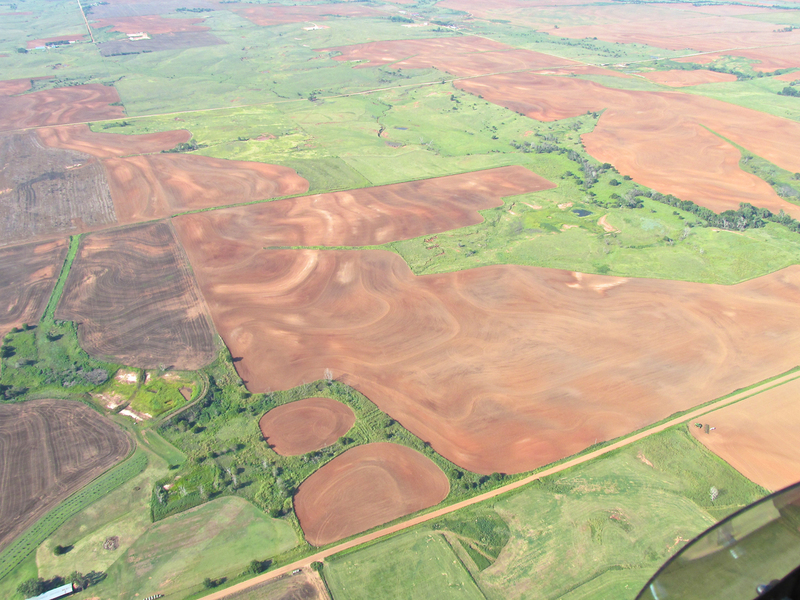 The well-kept airport runway is visible in the middle of the photo. 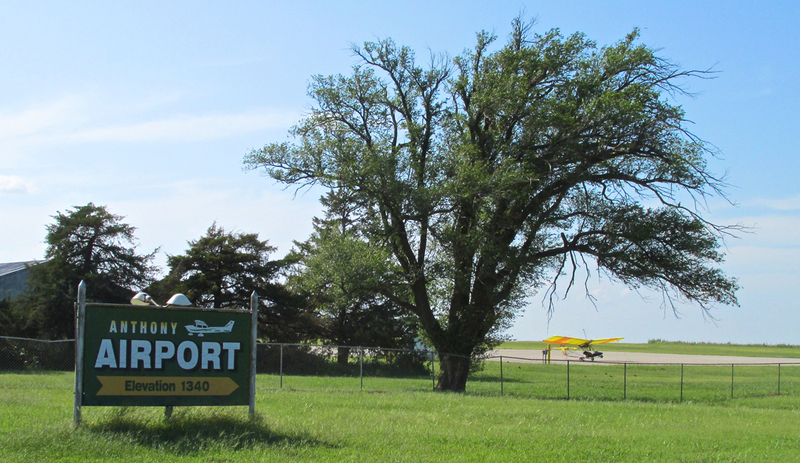 There was no traffic in the area so I passed by the North end of the Argonia Airport at about 75′ AGL. Railroad tracks cut East and West through Argonia’s South side. It is there I “bagged” this train. After crossing over the train track, I settled in for some “nap of the earth” flying. 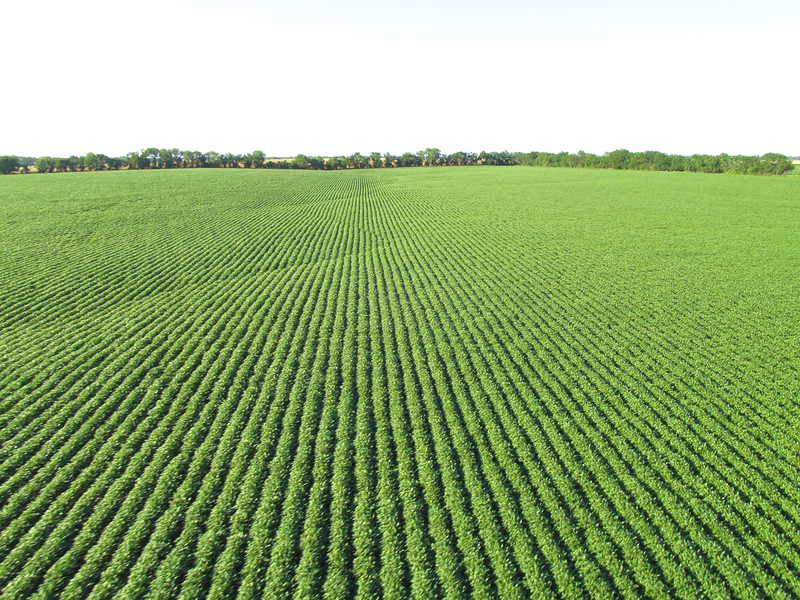 In this “GlennView” from Altitude 2′, we see a newly planted field. Pumpjacks and Tank Batteries: Clues regarding the title of this piece (“Anthony in the Middle”). 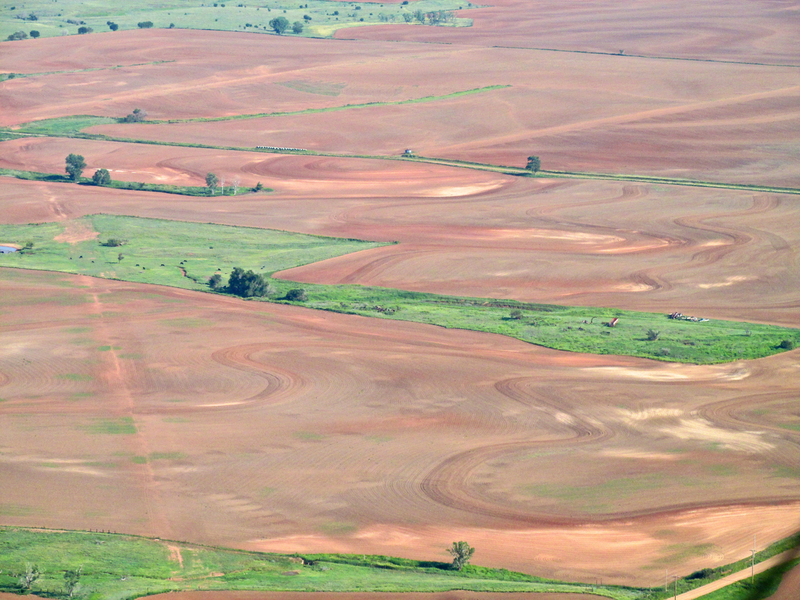 Here’s a wider shot of the same scene… How about the red dirt! I’m not sure what this is. 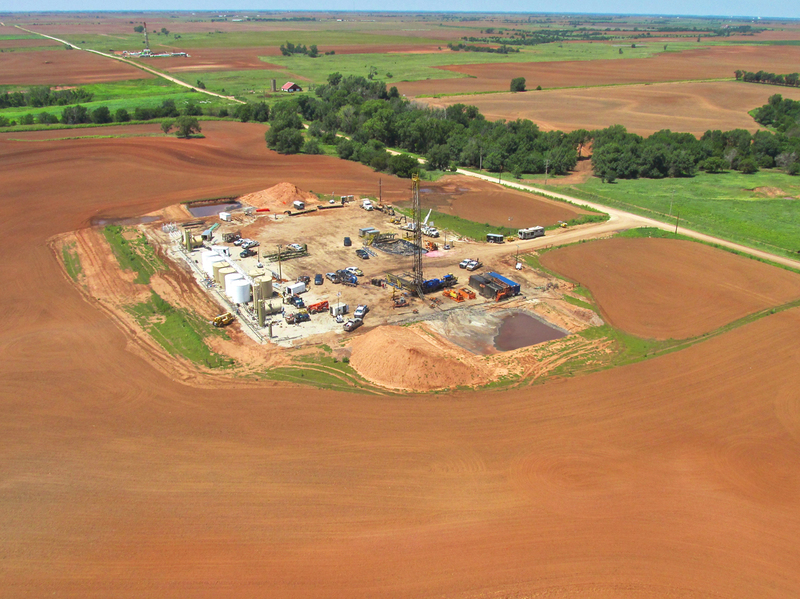 It could be an injection well or it could be where liquid is removed from the natural gas or something else altogether. A mile or so farther Southwest we see more activity. 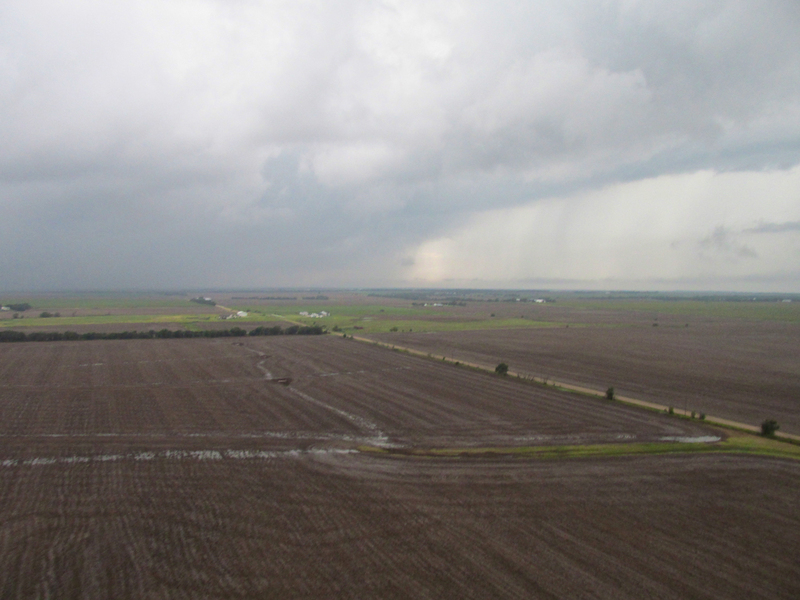 This was from 300′ AGL looking due West. Same as above but a little farther along. Anthony has been in the middle of an Oil Boom for the last three or four years and that gave me the inspiration for the story title. 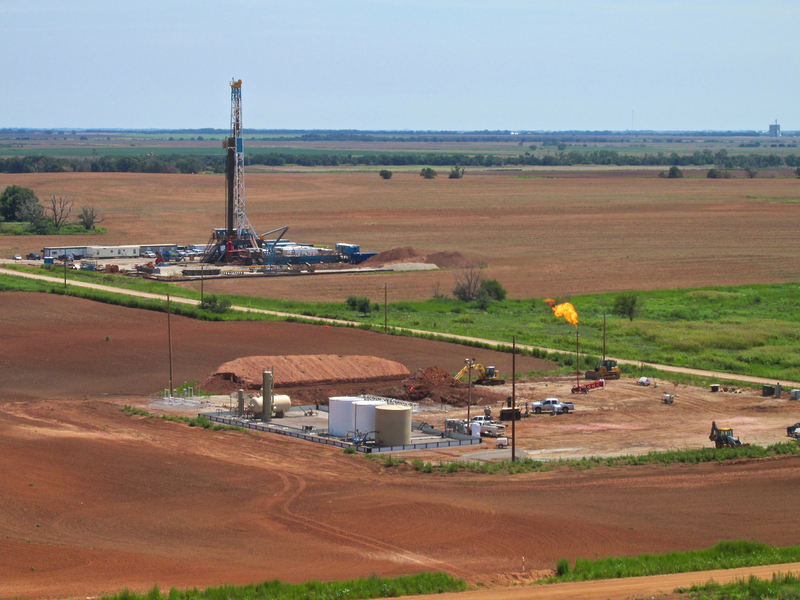 I have 3 times more photos of Oil Drilling Activity from the flight but I figure you got the point. Also consider that these are scenes from just the Northeastern Quadrant of the land around Anthony. 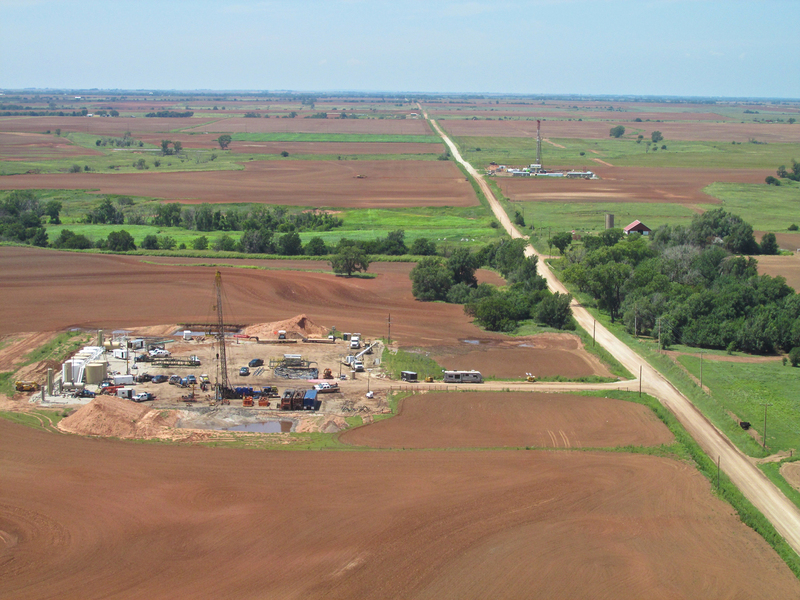 This Drilling Boom is a 360 Degree situation for them. 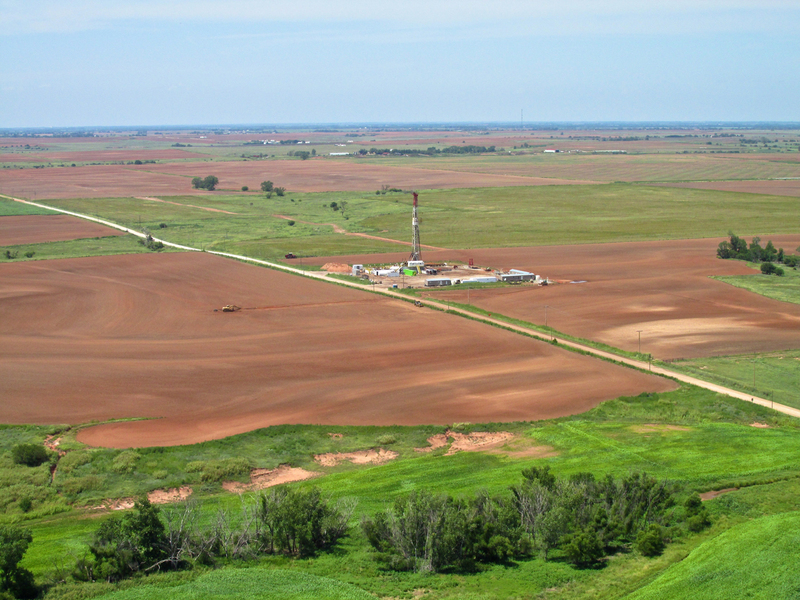 Kansas and Oklahoma have gone through Oil Boom and Bust Cycles for over a hundred years now. 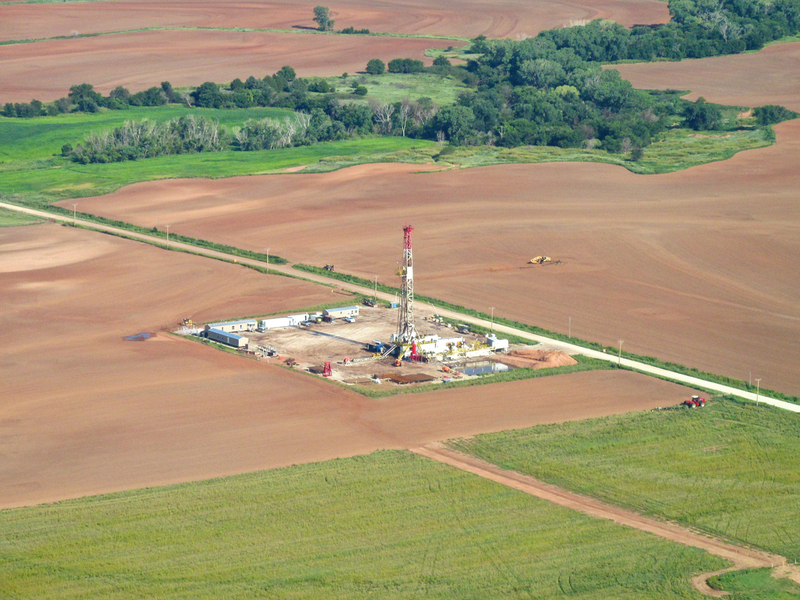 This latest Boom has been fueled by new technologies such as horizontal drilling and fracking. It has brought a lot of money into the area. 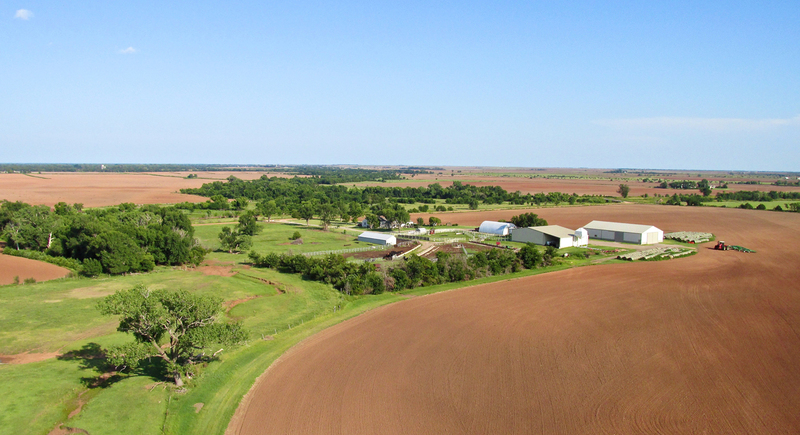 …back to agriculture and ranching. Cattle may be dumb but they’re not stupid. They know where to go on a hot August day. The Anthony Airport is almost 4 miles West of town. I was approaching from the Northeast and could have made a more direct entry to the airport but my SOP (Standard Operating Principle) is to take aerial photos of towns I visit before I land. The theory is that the weather may change while I am touring a town and result in photo conditions that are worse when I leave. It would be inexcusable to do a Sky Safari Story of a town with out any “sky pictures” of it. So here are a few pix of the town (I also took a few more when I left…). While I was taking these pictures I was climbing to pattern altitude for entry to the airport. So note the angle changes during the photo sequence. 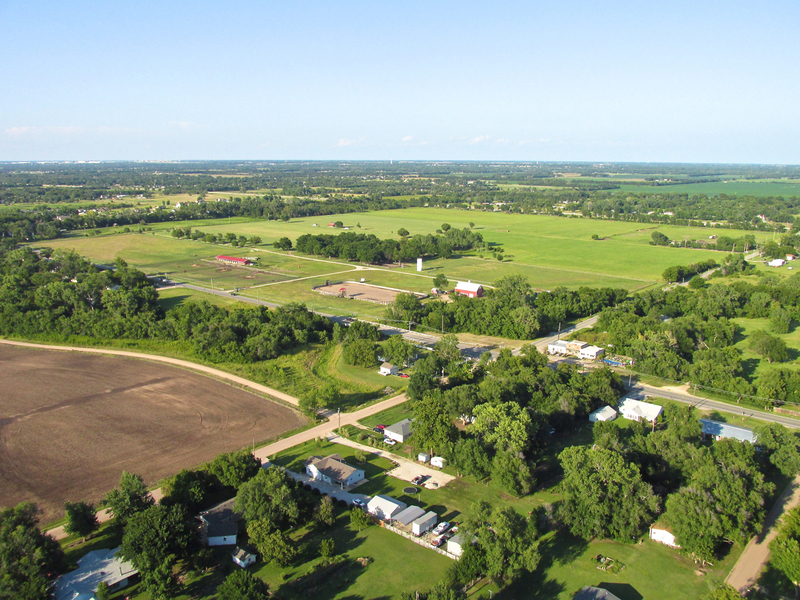 Anthony, Kansas from about 400′ Southeast. Same as above with a wider angle. 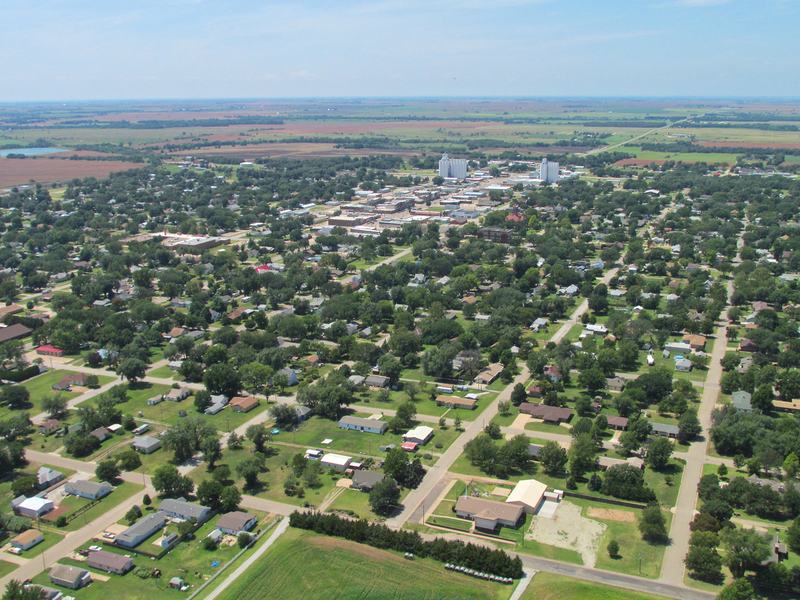 Downtown Anthony, Kansas from 800′ AGL looking North Northeast. 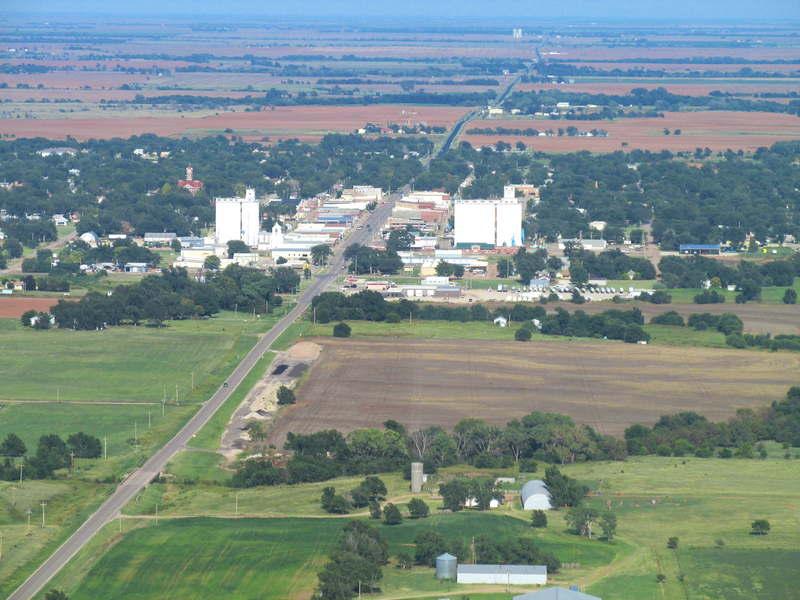 Note the two sets of grain elevators. Just to the right of the grain elevators on the left is the Anthony Museum. We will visit it soon. This is from the Southwest at about 900′ AGL. This telephoto is from about the same position as the earlier picture. I think this is Anthony Livestock Sales Company. 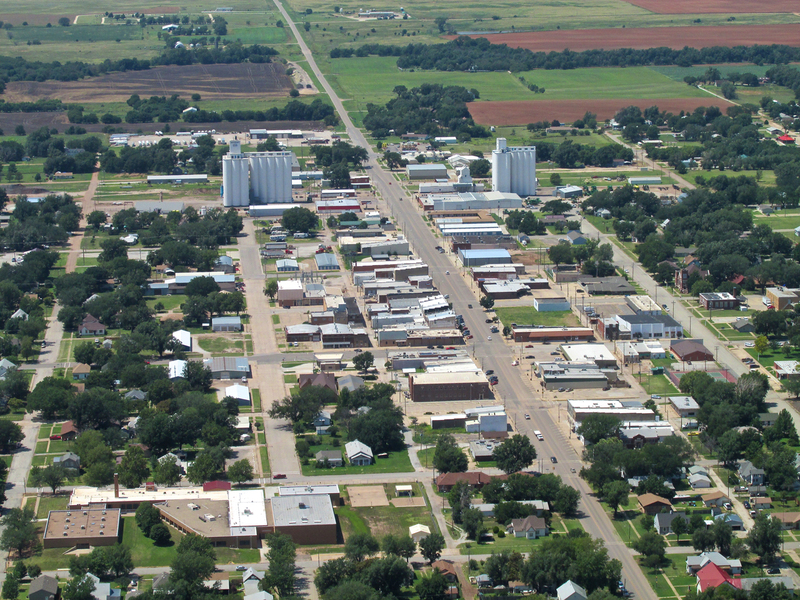 It is on the outskirts of the South side of town. This long row of buildings with purple roofs caught my attention. I will seek them out later in the report. 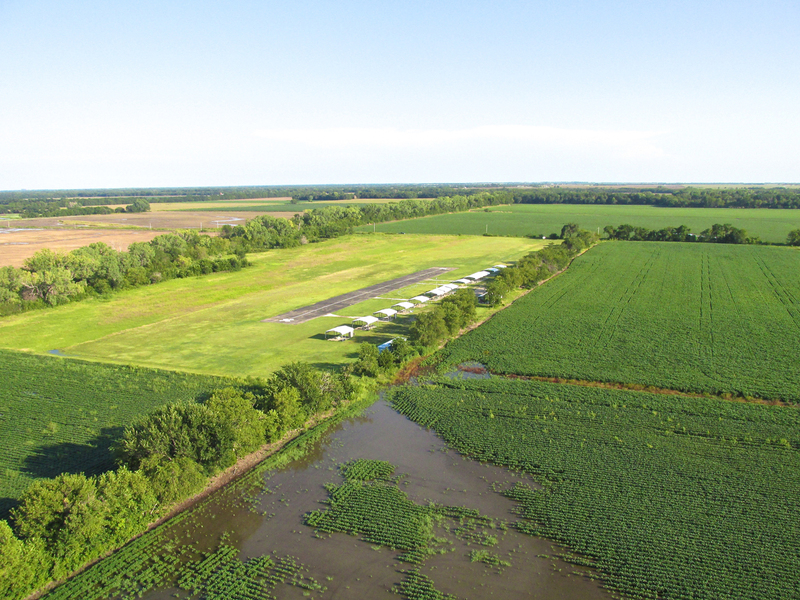 Anthony Municipal Airport as seen from 1,100′ AGL on the Southwest side of town. Below you see the tie down area of the Anthony Airport. In the photo caption I used the word “tarmac” with tongue in cheek because news reporters seem to be stuck on the term when writing about airports. Frankly, tarmac would be about the last thing you would want to taxi on as it refers to a mixture of tar and gravel smashed down by a steam roller. 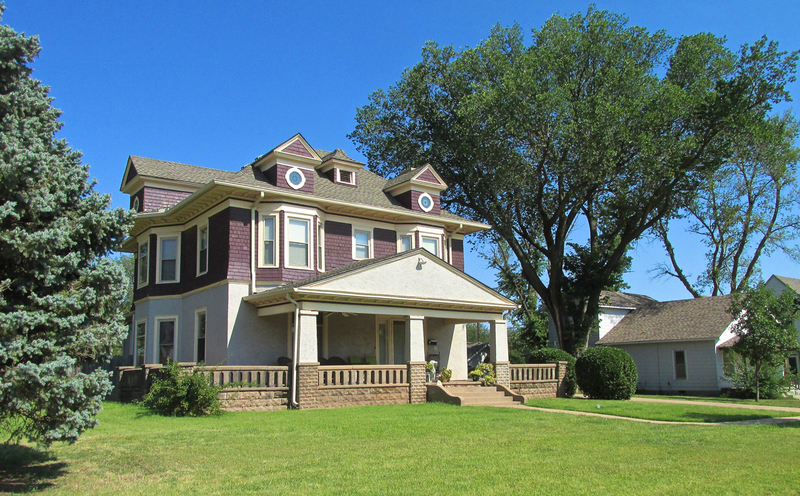 Introduced at the beginning of the 20th Century, it was a precursor to asphalt and prone to breakdown. While asphalt is OK, concrete is the best of all. For that reason I draw your attention to the surface below my plane at Anthony because it is one of the best small town airport runway and tie down combinations around. Very nice! They are also kind enough to make a Courtesy Car available to pilots. Since the airport is 4 miles out of town, this is huge. Tied down on “The Tarmac”. Anthony has a wide variety of attractions. I could only visit a few because of the limited ground time I have available on a Sky Safari. 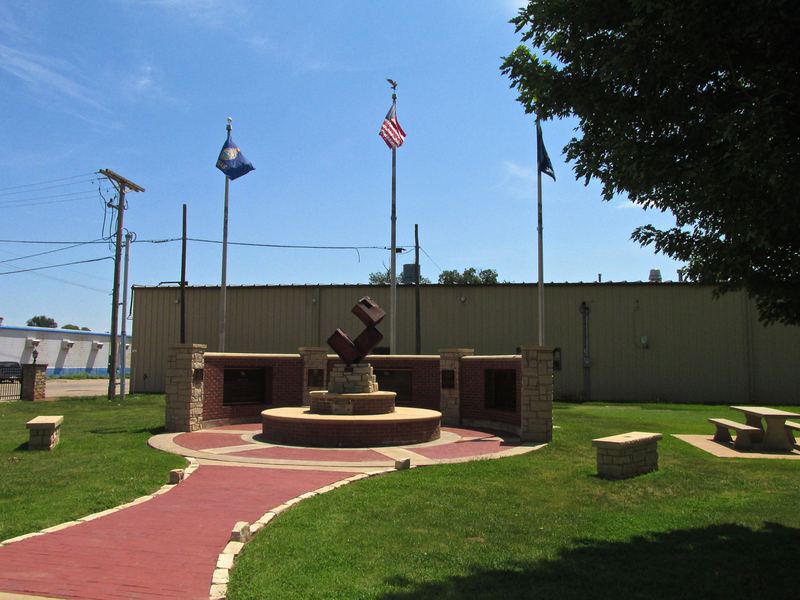 I had heard of the 911 Memorial built by the citizens of Anthony so I made sure to visit it. As it would happen, I didn’t need to search. Just as I was entering town, I saw the Mural shown below. Murals always get The Sky Surfer’s attention so I parked and walked through the park to take a picture of it. After getting the picture, I was getting ready to leave when I looked through the trees toward the East side of the park and spied what I realized must be the Memorial – it was. This is called “Destination Topolobampo”. It was painted to commemorate the beginning of the KCMO Railroad in the United States on 10 May 1902. 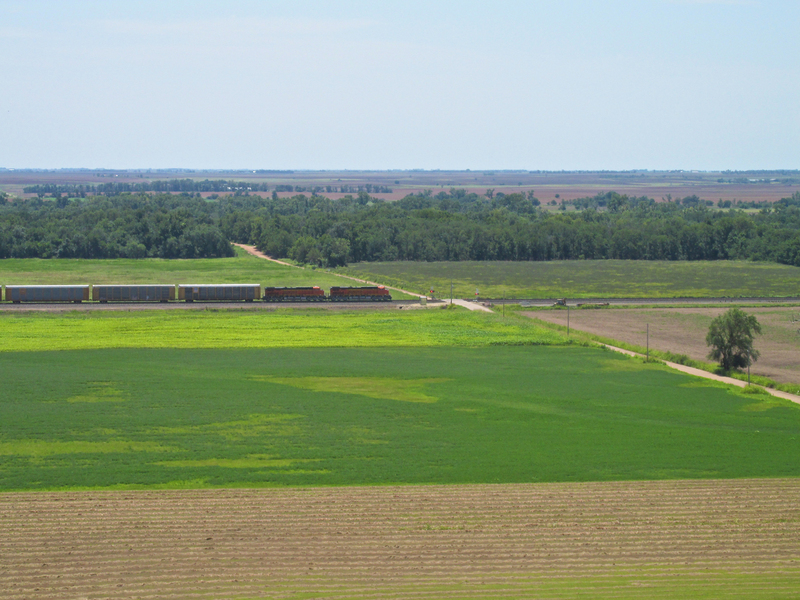 This railroad connected Kansas City with Topolobampo, Mexico. 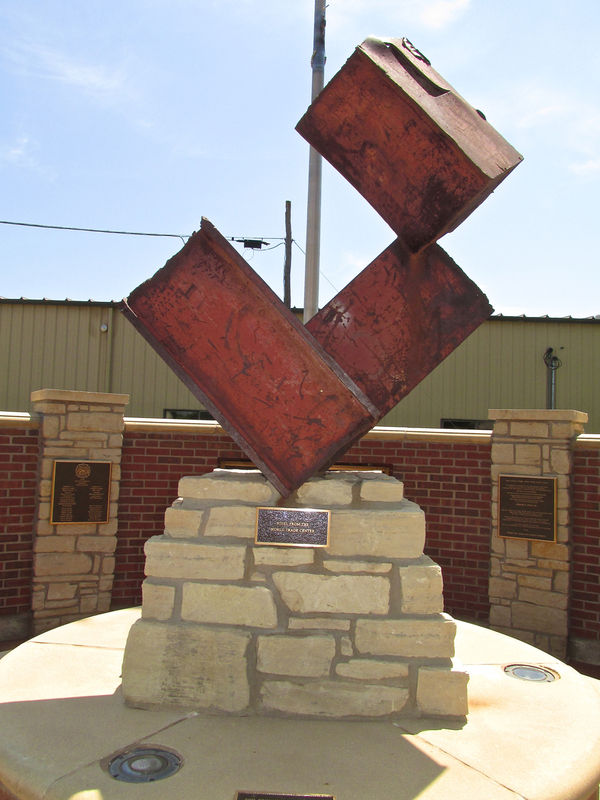 The Memorial which is formally named “The Official State of Kansas 9-11 Memorial“ represents quite an effort on the part of all involved. It has been built solidly to last. 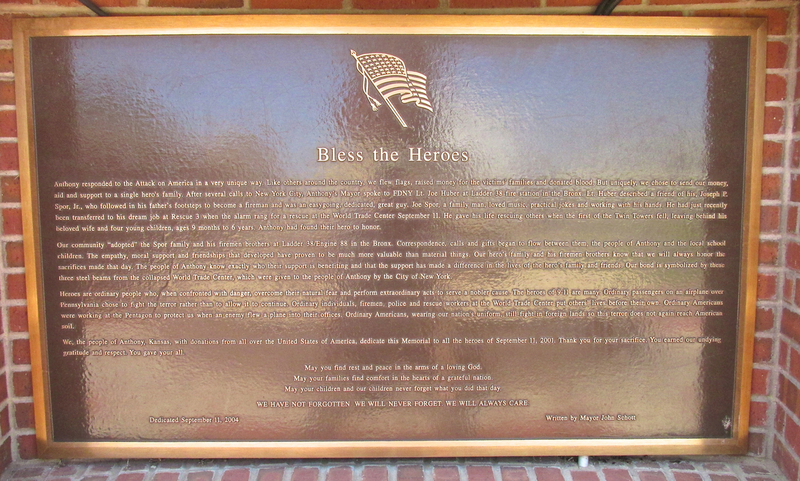 I have included some photos of the Memorial and a shot of the embossed salutation to provide you background. If you follow the link in the first sentence of this paragraph, you will learn even more about it. I would encourage everyone to visit it if you are in the area. Actual beams from the Twin Towers provide a center piece for The Memorial. The path leading up to The Memorial contains embossed bricks bearing the names of those who donated in order to make this monument a reality. 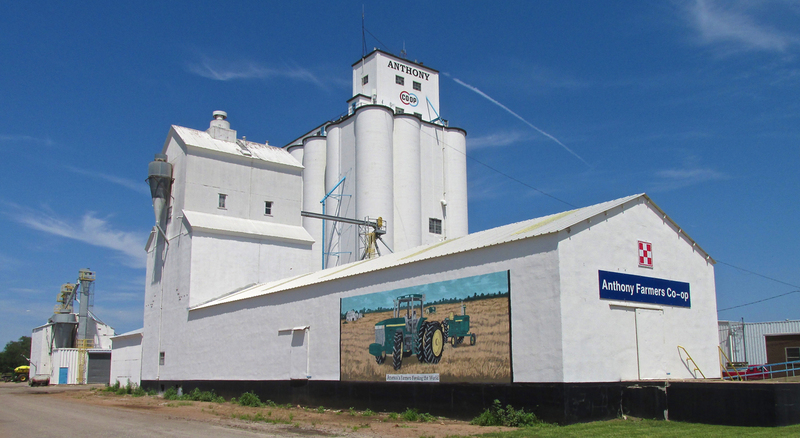 After coming out of the park I looked across the street to see one of what is typically the largest edifice in a Kansas small town – Grain Elevators. This one features a huge mural on the West side. 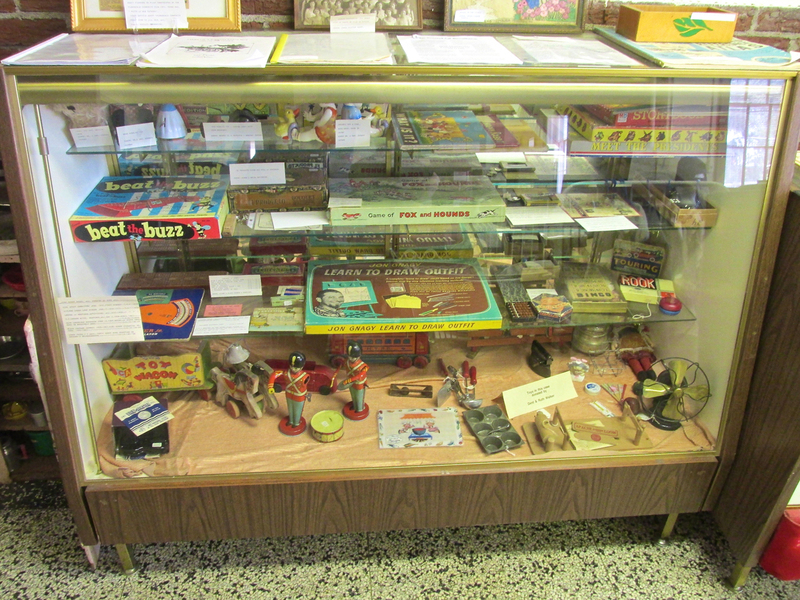 On the other side of Main Street, I saw one of my favorite things, a Museum. I usually don’t go to museums on my Safaris because I can get drawn into them and spend hours. As I said earlier, while I don’t have a strict timeline, my Sky Safaris take place in the span of one day. A good part of that is taken up in the air. If I am going to get a good sense of a town I need to spend some time walking or driving through it. 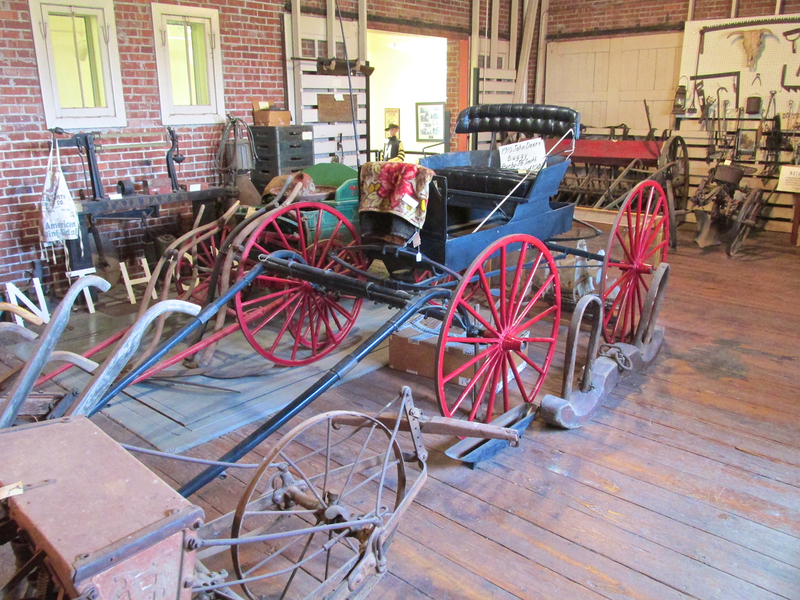 Nonetheless, this museum had some outside exhibits of early farm machinery. I figured, “What harm could it be to just take a quick look?”. I drove across the street and parked the car at The Anthony Museum. The hook was set. 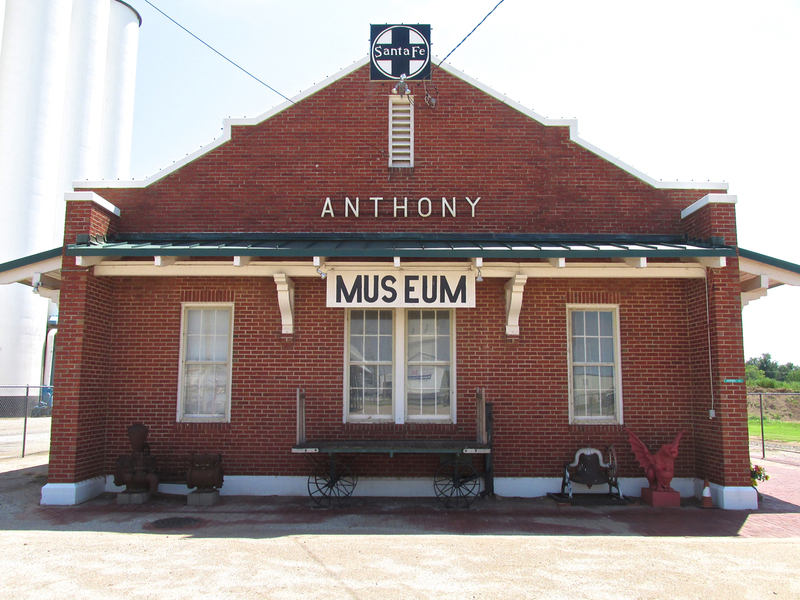 The Anthony Museum is housed inside the former Santa Fe Railroad Station which was built in 1928. 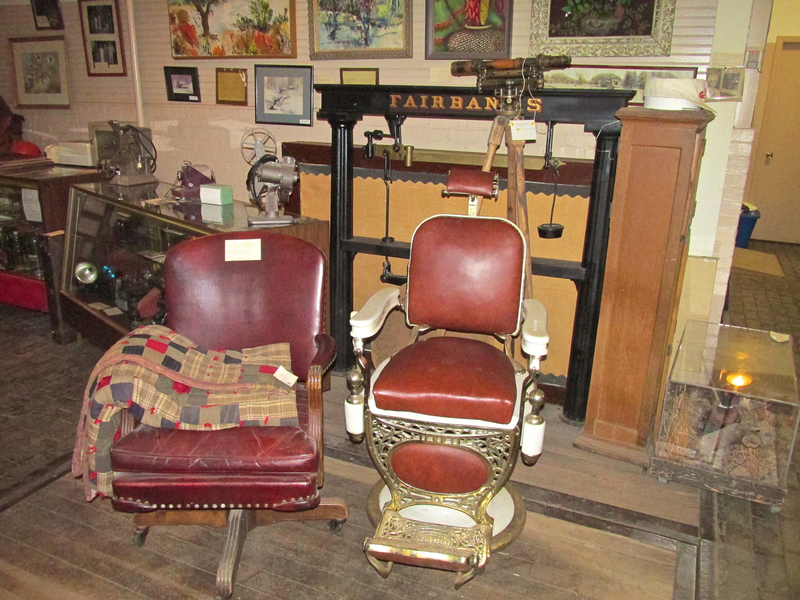 The museum took the premises over in 1984. 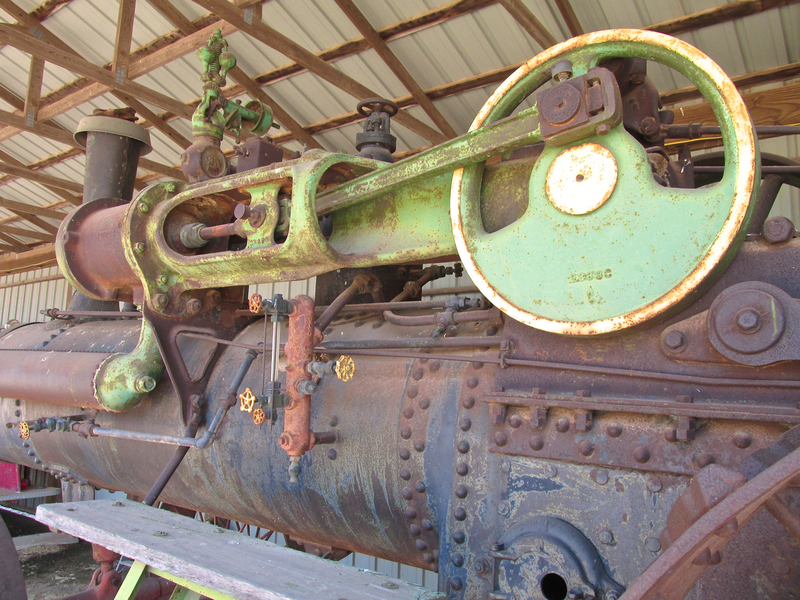 While some might see rusty junk, I see marvelous physical history in old machinery like the items on display in Anthony. It is commendable that the citizens of Anthony think enough about their heritage to keep it “alive” for others to appreciate and learn from. I took some notes but don’t have any regarding this machine. I think it is a hay baler. 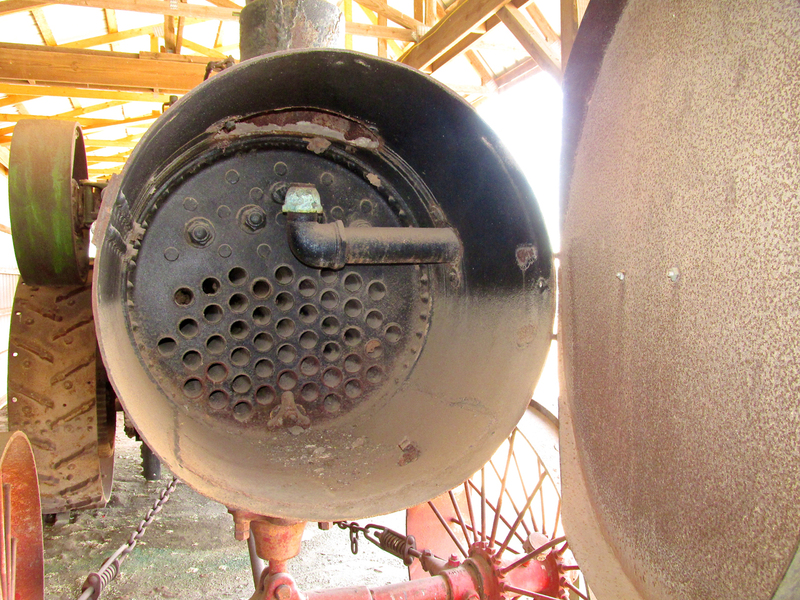 All I can say is “Wow!” – an actual Steam Tractor! You had to be a unique combination of mechanic, heavy equipment operator and dare devil to pilot one of these. 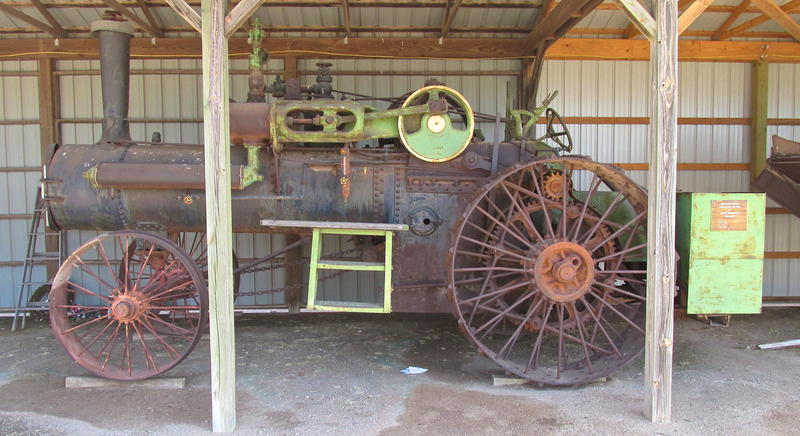 I guess that’s what they call The American Farmer… This is a 65 Horsepower Case Steam Tractor donated by Smokey Billue, Bill Starks and David Spencer from the Estate Auction of Luther Henderson. The boiler was open. It was too dark in there so I used the camera flash so you could see the tubes that ran through it. 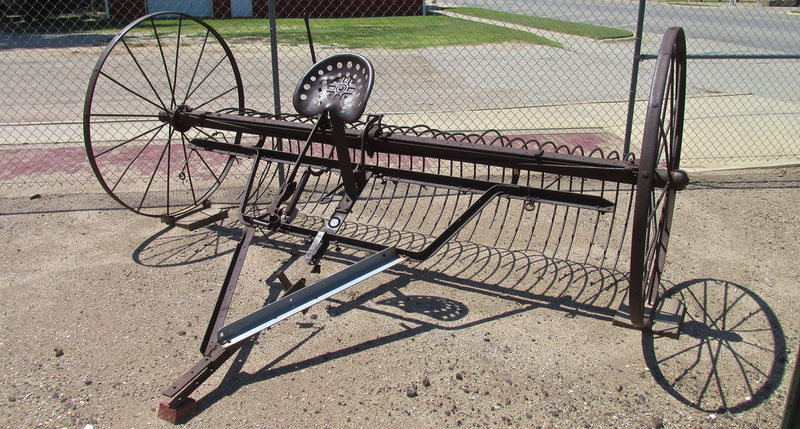 This is a horse drawn rake. An earth moving blade or scraper. 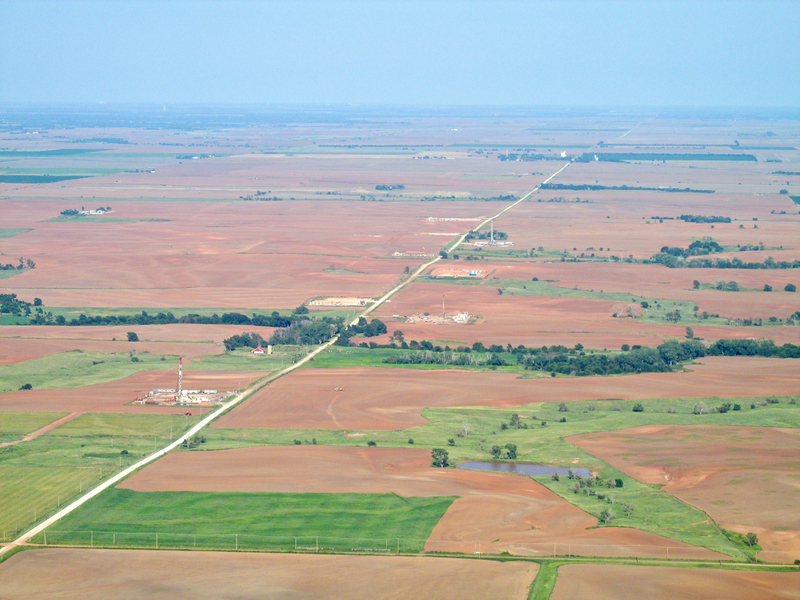 You might think it is flat in Kansas but there are plenty of places where a Farmer might want it flatter! 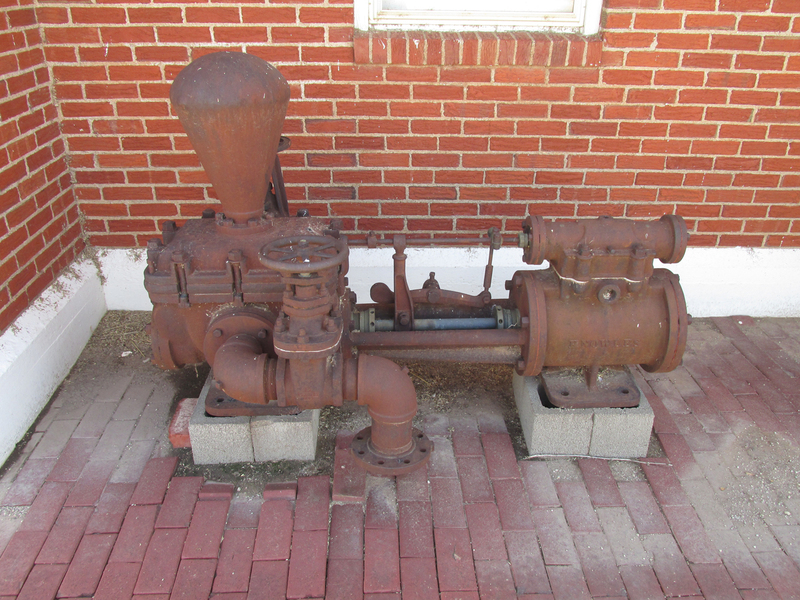 There was no sign on this but it looks to me like a well pump for irrigation. 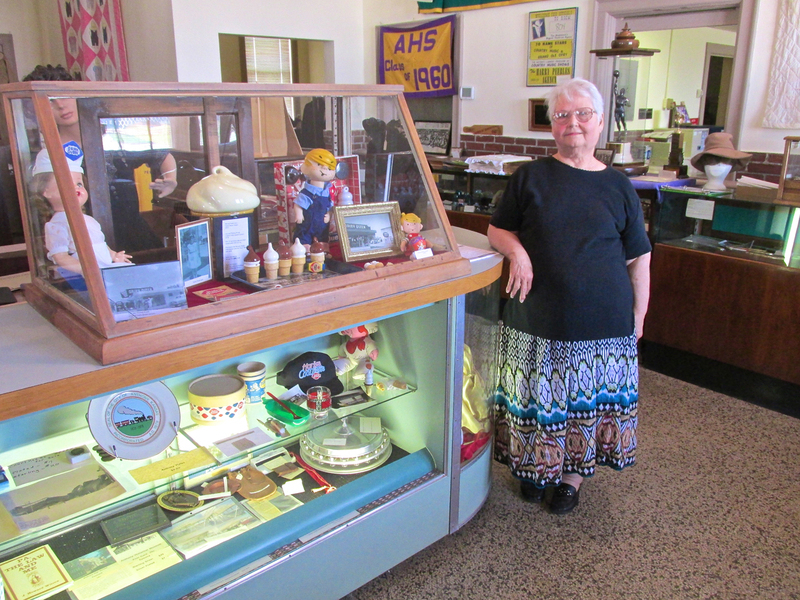 Ruth Perry greets and guides visitors through The Anthony Museum. As I walked in the door, Ruth Perry the museum guide, was saying goodbye to a family that had just toured The Museum. I introduced myself and told her my mission. I asked if she could direct me to the high points of the collection because my time was limited. She tried her best to keep me focused but I was continually drawn to additional items. I have trimmed my photos down to the bare minimum for this report but I think they give you an overview of this interesting place. And, Hey! 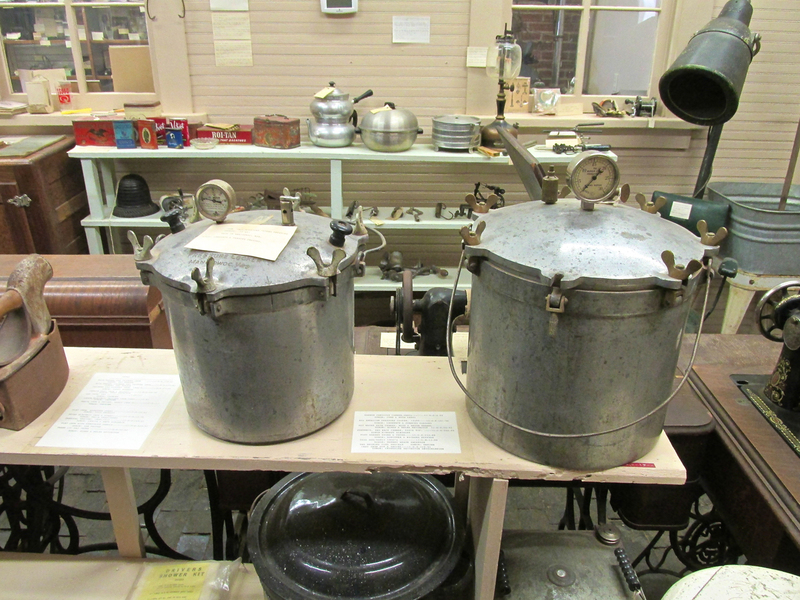 The Museum is Air Conditioned, too. A fine respite from a witheringly hot day. 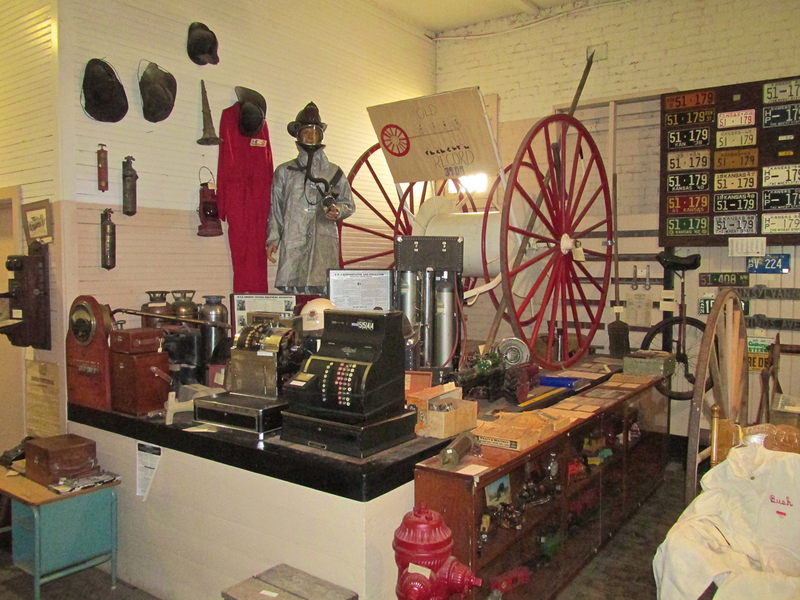 A variety of items from fire-fighting to retail money-changing reside in this corner. 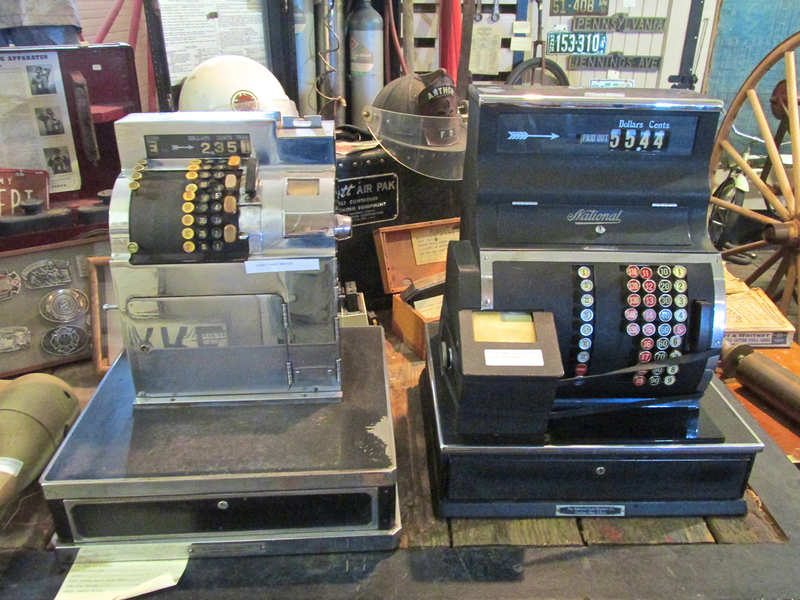 Cash registers like these were still in use when I was young. 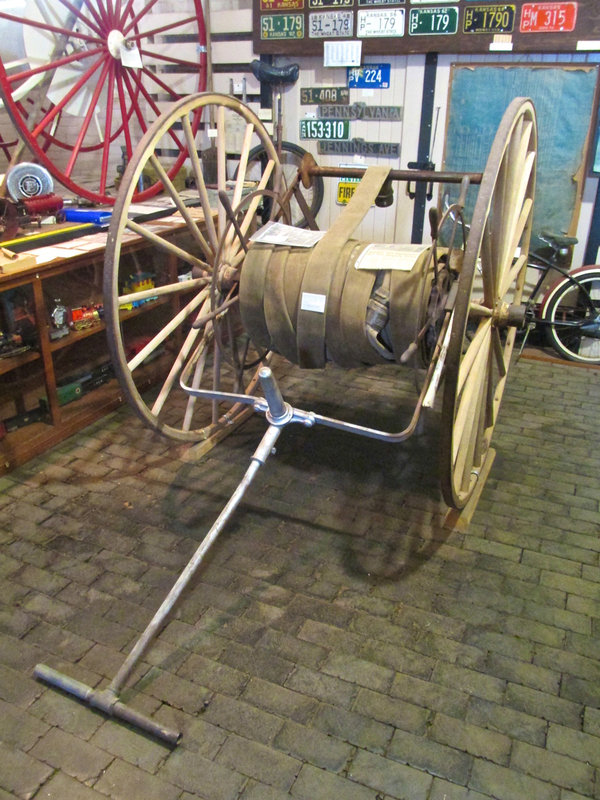 A famous Fire Hose Reel from the Manchester, Oklahoma Fire Department. 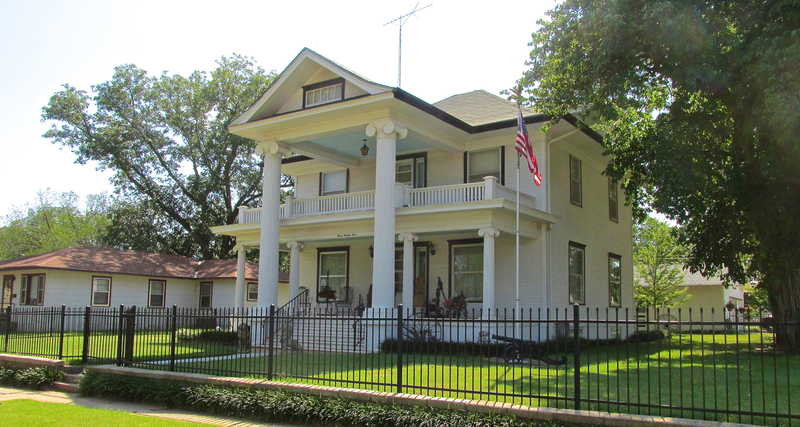 The kept it from 1856 – 1996. 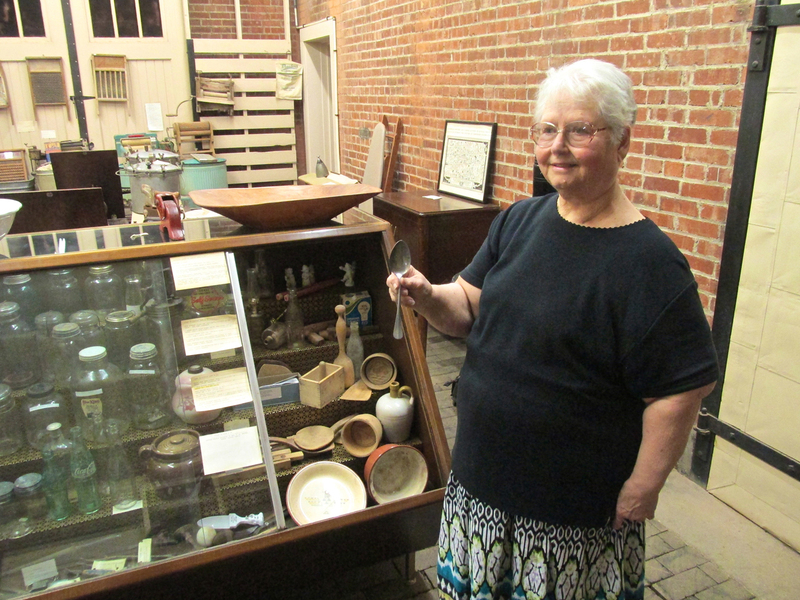 Ruth shows an aluminum spoon that was made in Germany after WWII from wrecked or salvaged warplanes. Quite a continuum. 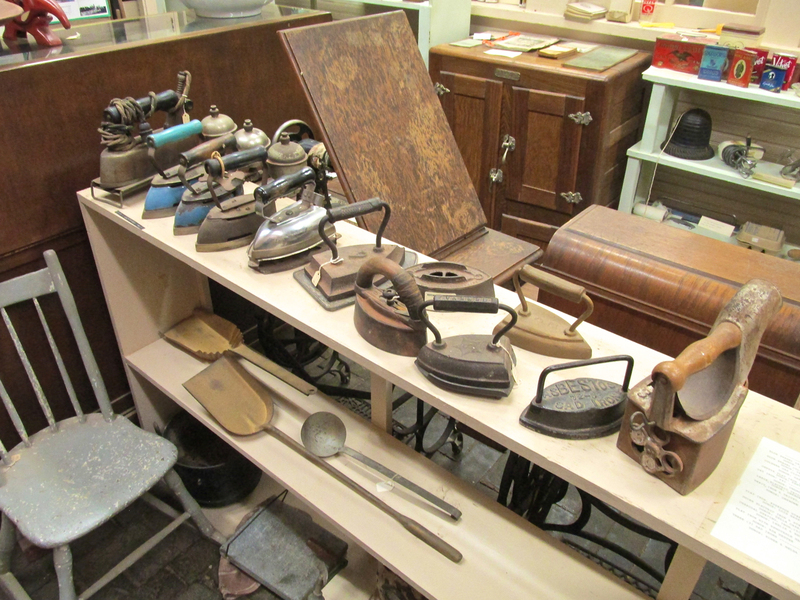 Stove Heat Irons to early Electrics. 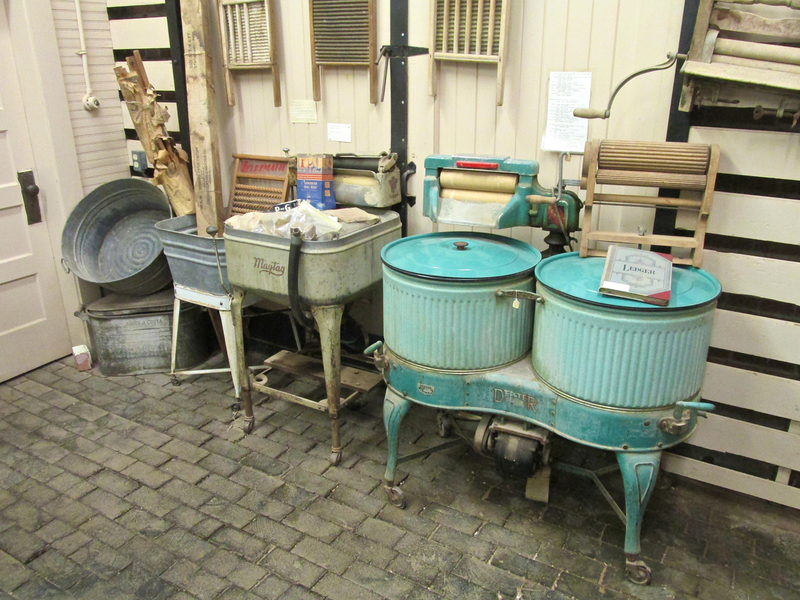 Another continuum: from a Washboard to an Early Electric. America has always depended on the Heartland to man it’s armies. 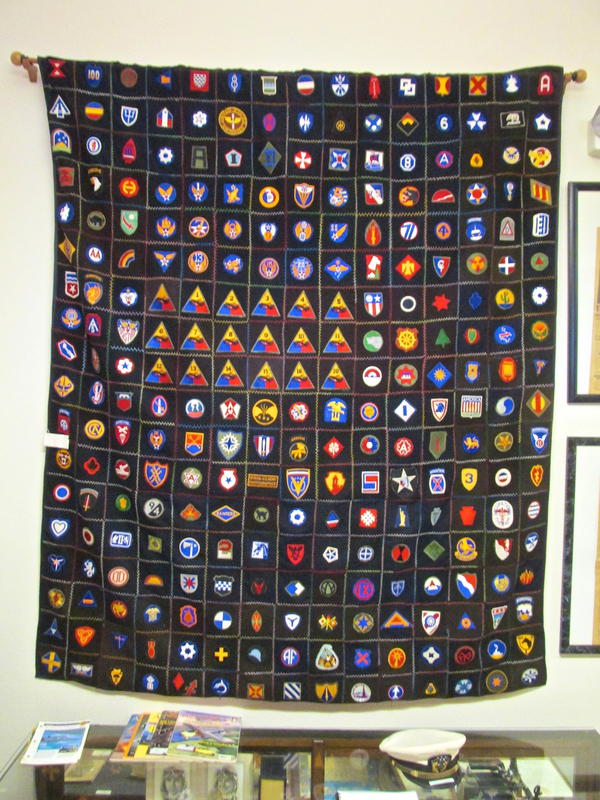 Besides the quilt work, I am impressed with the collection of Unit Patches. 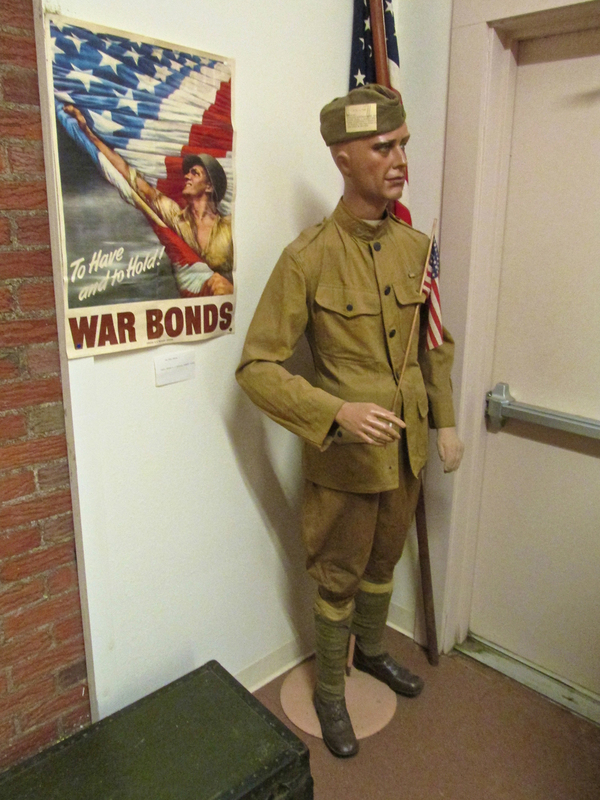 Anthony produced a number of War Heroes. 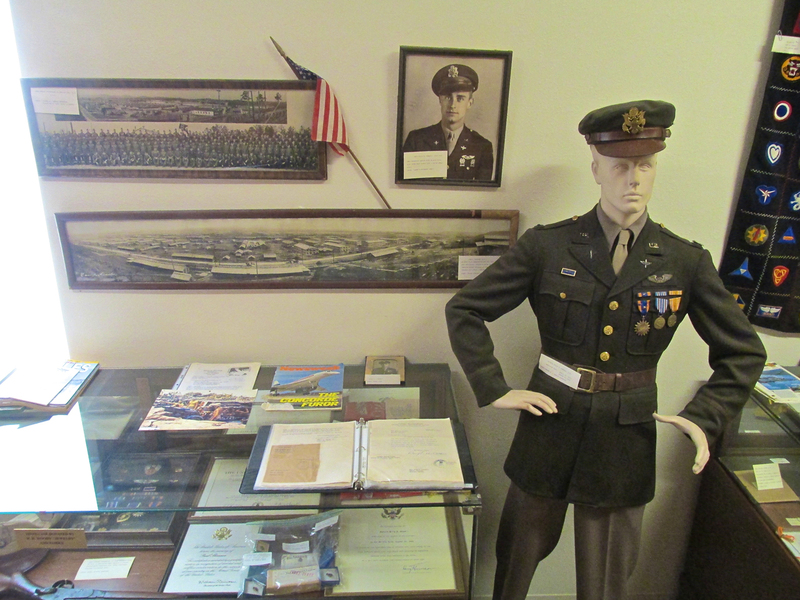 This is a collection of memorabilia dedicated to Aviator Captain Bill D. Connell. His aircraft crashed into the harbor of Naha, Okinawa on 22 August 1945. 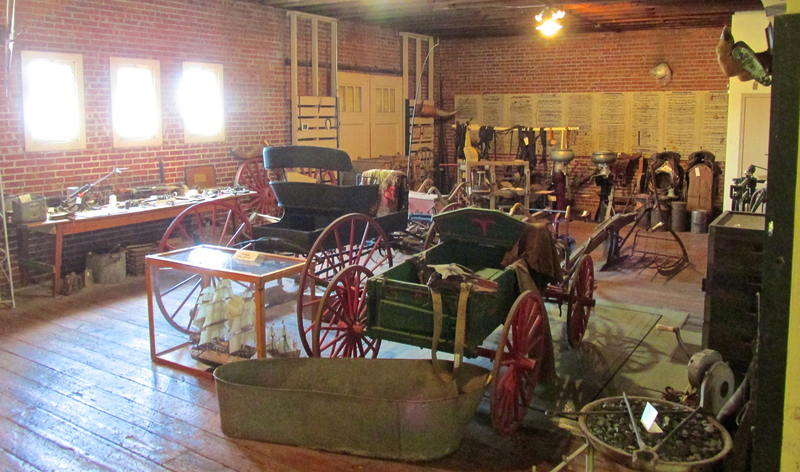 Another room full of ranching artifacts. 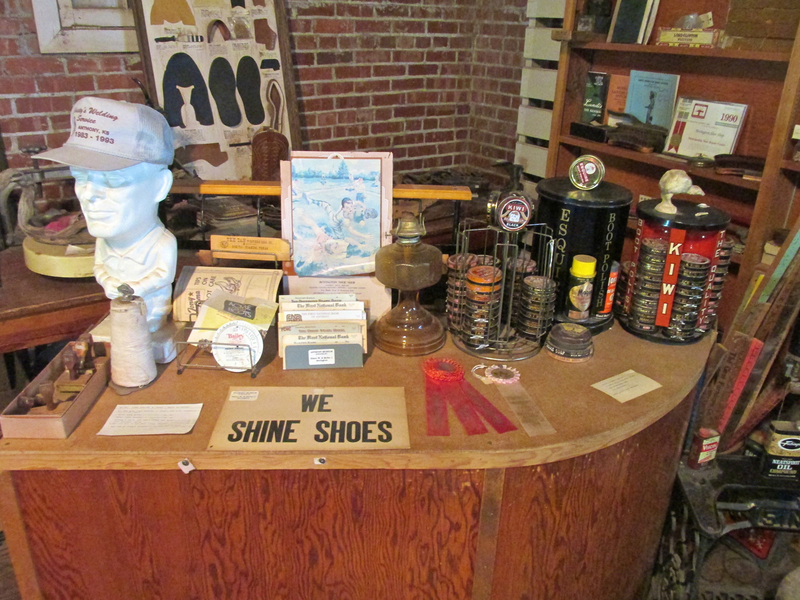 This is Elmer and Elma Bevington’s shoe shine item collection. 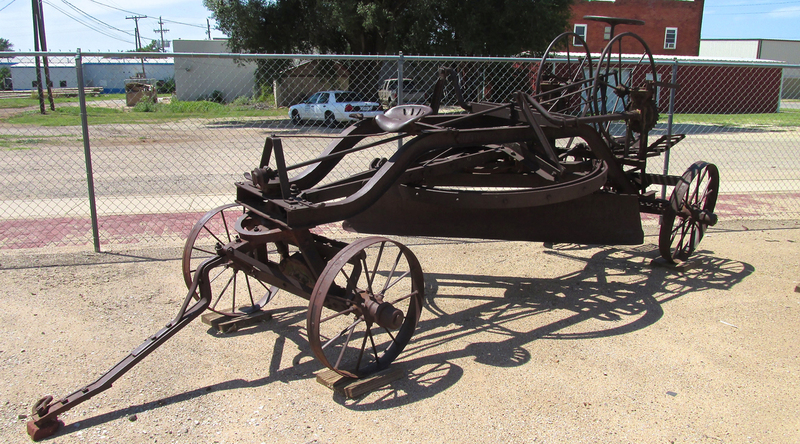 This is a 1910 John Deere buggy. I learn something new everywhere I go. I had no idea John Deere made anything but tractors and farm machinery. 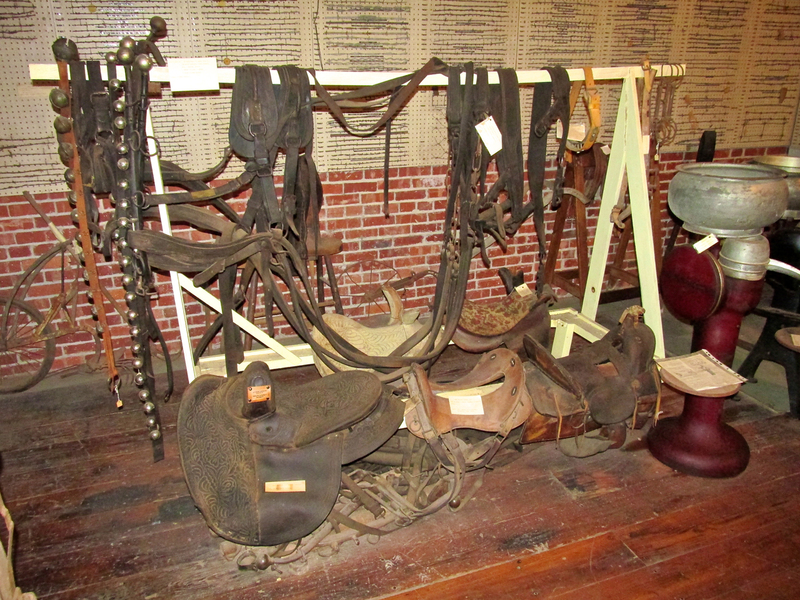 Of course with buggies you need harnesses and then horses need saddles. On the wall you can see a quite extensive collection of Barb Wire designs. Even though I was enjoying it, I knew I had to get moving so I could show you more of Anthony. I bid Ruth adieu, thanked her for the personal tour of the Anthony Museum and set out to see what I would see. Well, even though I say I don’t have a method when exploring a Sky Safari Town, I “kinda” do. “Inspired serendipity“ is its name. I thank God for my good vision (it used to be more like an Eagle’s but now it is at least normal). With my eyes I scan the area and go to whatever looks interesting. You’ll find that old stone or brick buildings draw The Sky Surfer. People and animals, too. Invariably as I head off toward something of interest, more shiny nuggets appear in my path. I am never bored. Chambers of Commerce like a modern look. A well-kept flower garden and attractive mural are next to The Chamber. Art Deco always gets my vote! The Hurd Building looks like a castle. 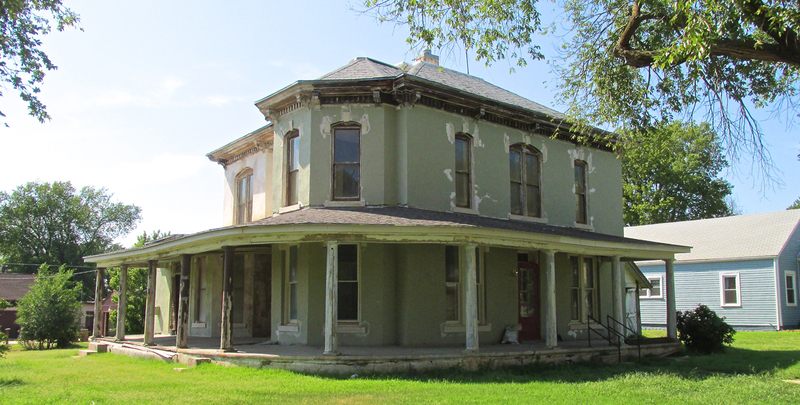 Around one corner I read a sign stating there was “Restoration in Progress” and that it was being done by The Kansas Heritage Trust Fund. I think this is a great thing. 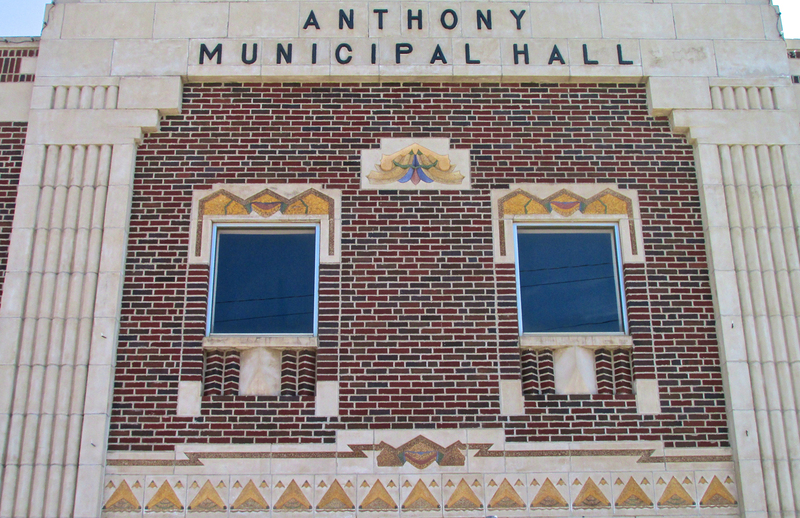 Anthony’s Municipal Hall was built to last. I much appreciate the artwork on the facade. 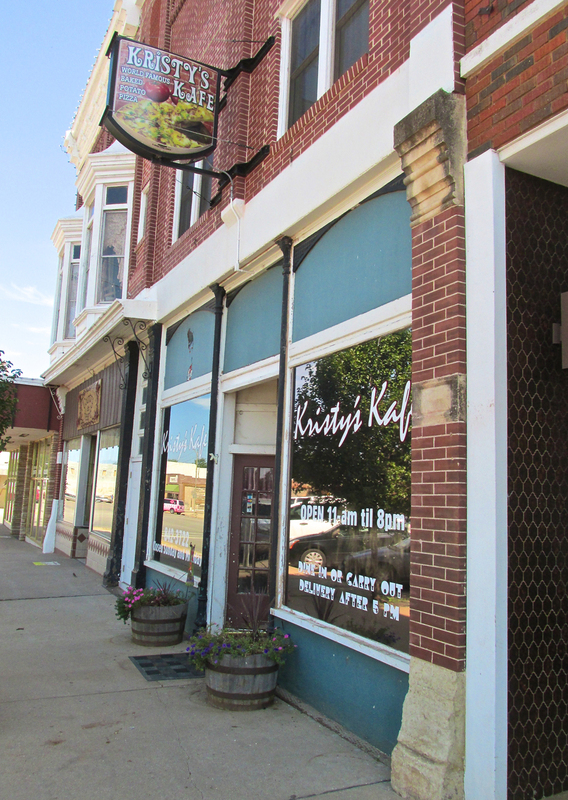 Kristy’s Kafe has a modern sign while retaining the charm of an earlier time. 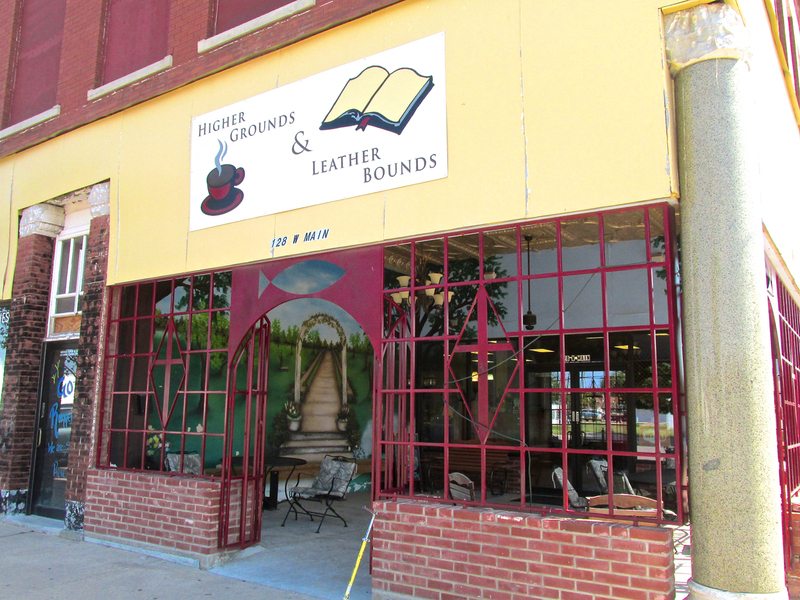 Definitely the place for serious readers. The First Congregational Church has a dignified look. Earlier I said my discovery method when visiting a new town is “serendipity”. I need to qualify that. Usually I do some research prior to visiting a town. This can give me a “hook” for the story but most of all, it keeps me from looking too stupid. 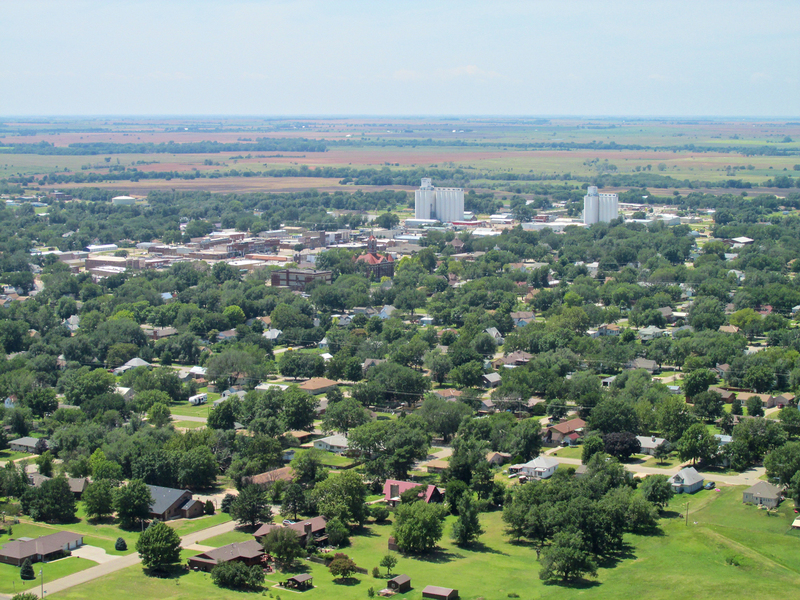 Example: “A Flight to Severy, Kansas“. Prior to that flight I was preoccupied with camera mounts and other preparations for making a movie of the flight that I did not take the requisite time to research the town. If I HAD, I wouldn’t have missed the attractive Severy United Methodist Church. There are hundreds of large trees in Severy and the walking discovery path I took around town put them between me and the building. So, I didn’t see it until I took off to leave the area. Duh. 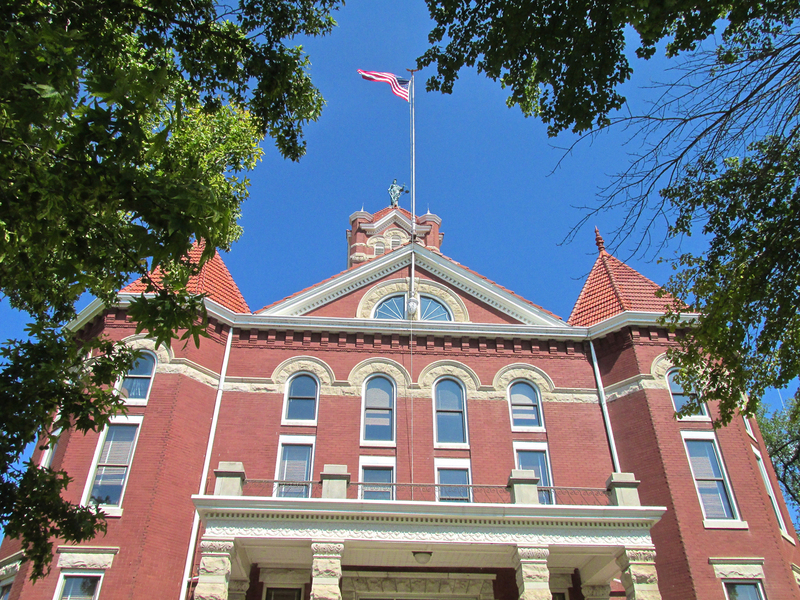 Anthony is the Harper County Seat. 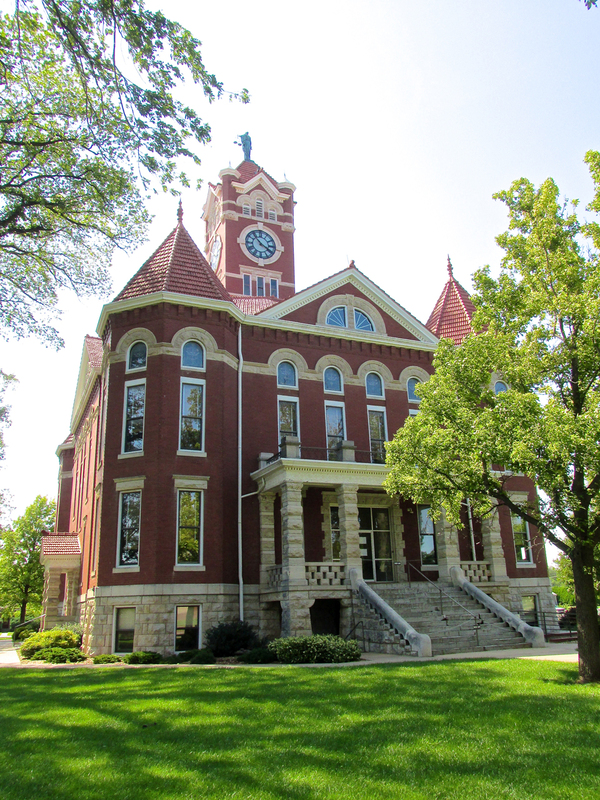 My research showed that in 1907 the folks built an impressive courthouse building. In the ensuing years it has been kept in excellent condition. I put it on a short list of things I must not miss on my journey. The imposing structure is quite something to see, so I have included a number of shots. I love that there are so many trees in our towns and cities but from a photographer’s standpoint, they often get in the way. The trees in Anthony are very close to the main entrance of the Courthouse and make it impossible to get a complete view of the building. 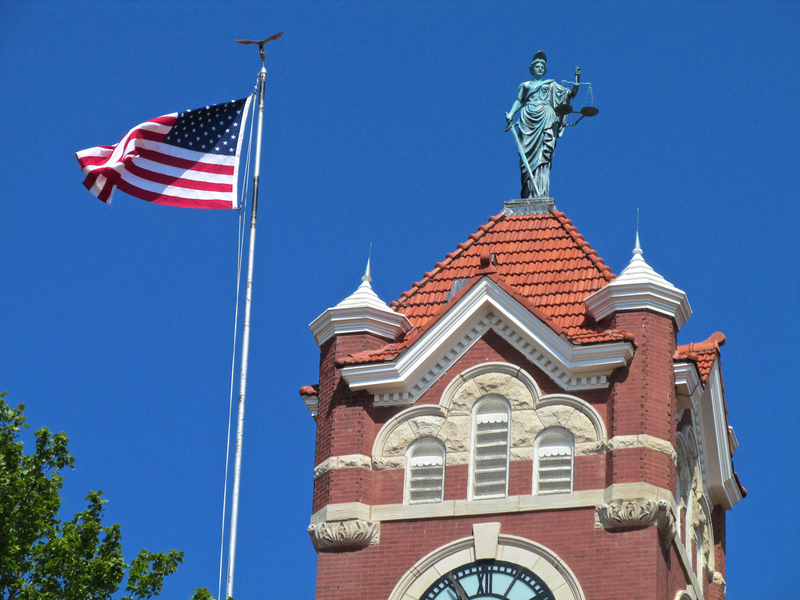 From the West, we can see Lady Justice at the crown as she looks over our American Flag. 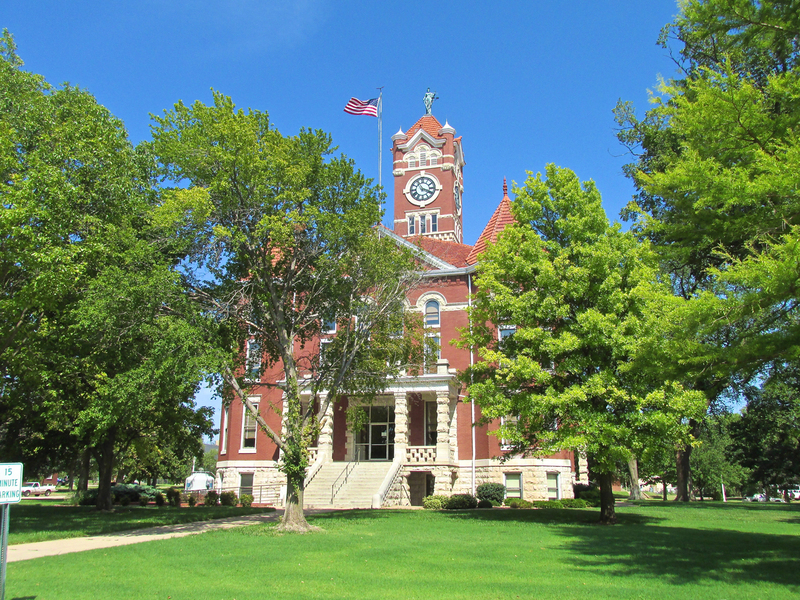 The Courthouse as seen from the West. A telephoto view from the West of the fine statue, stone and brickwork at the pinnacle of The Anthony Courthouse. 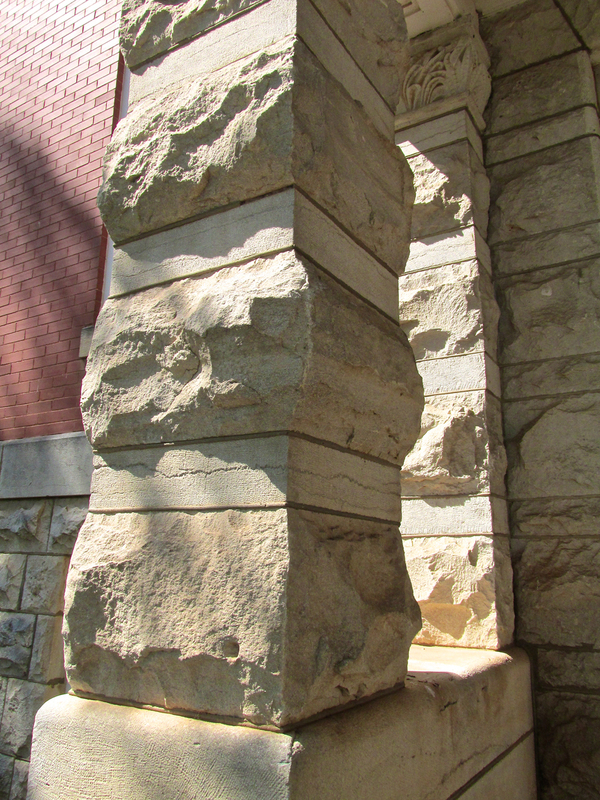 One of the stone columns that guard the entrances to the building. By now it was mid-afternoon. The Sun wouldn’t slow down and I needed to complete an important part of this Sky Safari Adventure before I took to The Wild Blue: Houses and Churches. So, I jumped into the Courtesy Car and cruised through the parts of town that I thought might contain them. I can’t say I photographed every nice house but here are a few that got my attention. Brick and Stone, a nice lawn and manicured foliage mark this dwelling. I think this is Grant Sechler’s house (see later in the report). 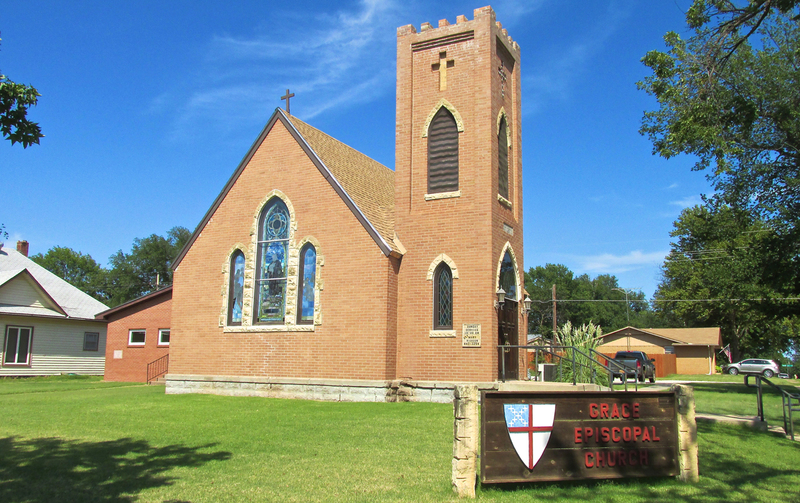 Uplifting Indeed, The Grace Episcopal Church was built in 1908. 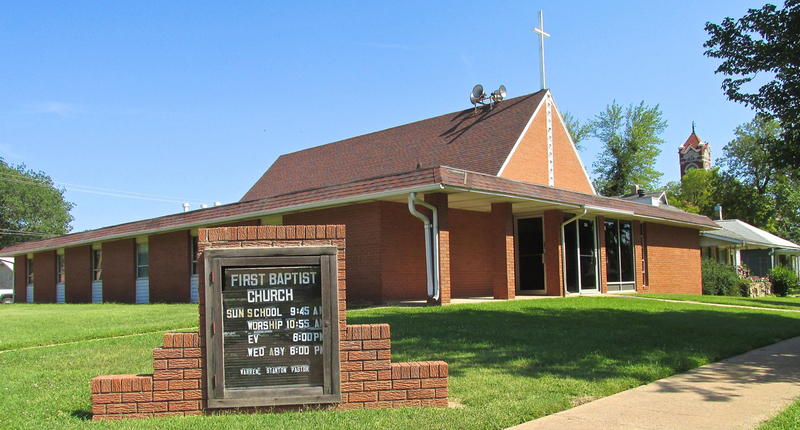 Down the street from the County Courthouse we see the purpose built, practical First Baptist Church building. How great to have a canon in front of your house! A nice neighborhood with the water tower near by. I wouldn’t be surprised if this was designed by the same architect who built The Courthouse. The First Pentacostal Church is on the edge of town. 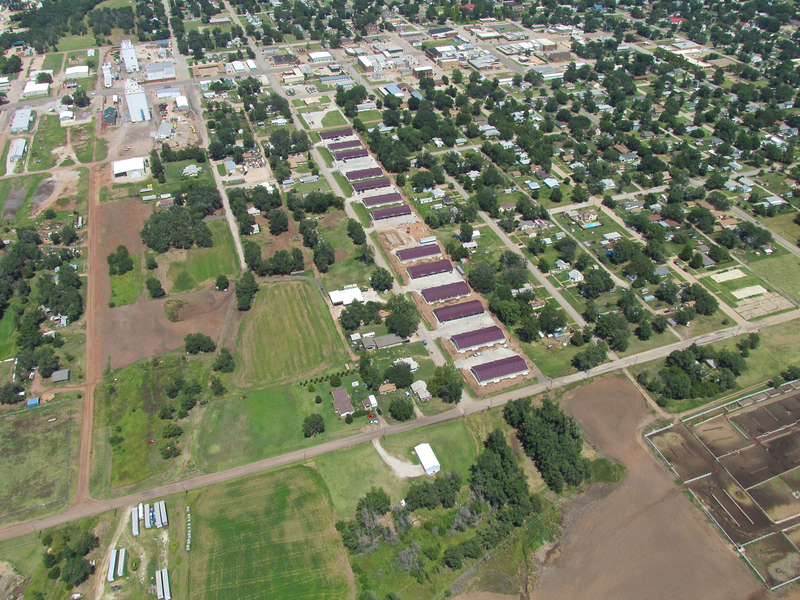 I found the long column of “purple roofed” buildings I saw from the air. 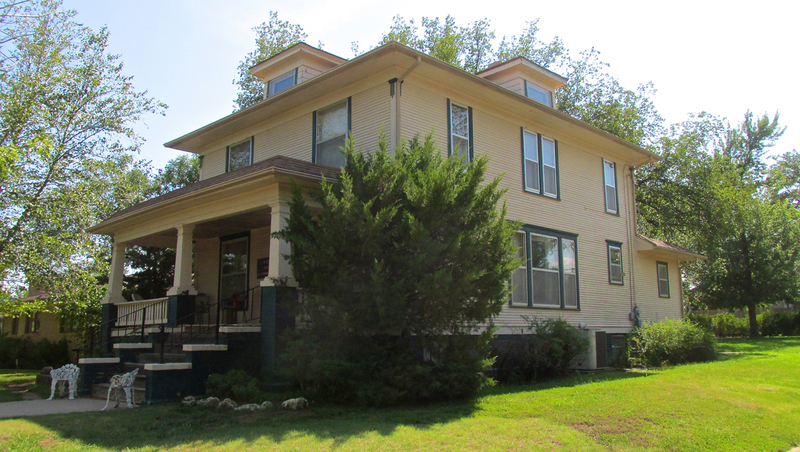 They are apartments – most likely for the influx of oil field employees that have moved to the town. I had just put gas in the Courtesy Car and was heading to the airport when I saw one more mural in the rear view mirror. I swung a U-Turn and came back. 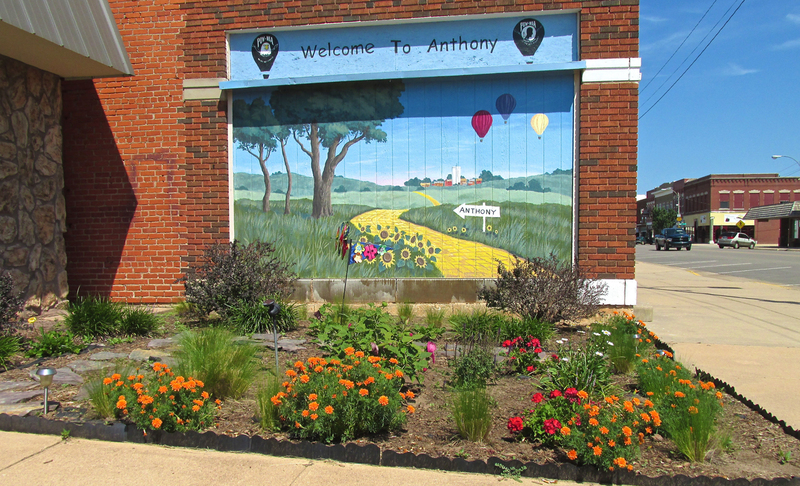 Obviously for those who live in Kansas, the scene on the side of the Anthony Motel & Cafe is not a local landscape. Nonetheless I offer it to you. 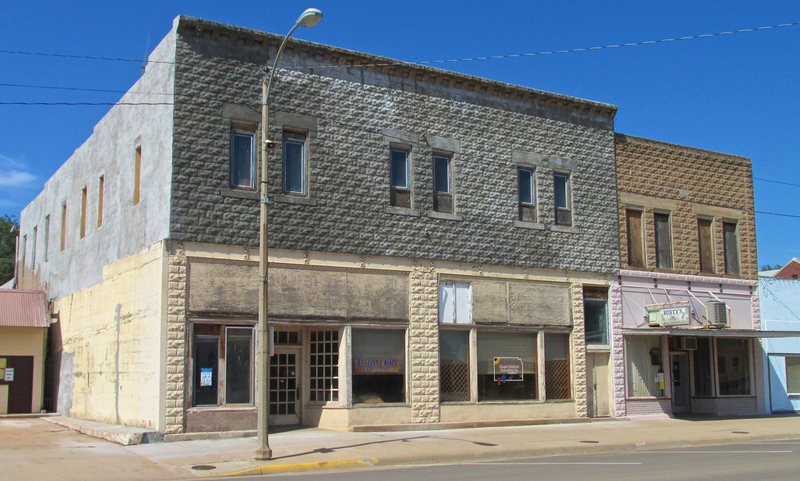 Not a mile West of town on Highway 44 / Main Street is Reflection Ridge. I could have cropped the photo more but I wanted you to see the magnificent, natural tall grass prairie that surrounds the Conestoga. It seems to bear the settlers in the way the Mayflower brought earlier generations across the Atlantic Ocean. I searched the internet to find the artist who conceived this project but could not find him. Anyway, Nice Touch, Anthony! Upon return to the airport my “mental camera” spied the scene below. I parked the car and ran through the field to get to the right spot and snagged it. All the while I am hoping I don’t also snag a crop of chiggers… My problem is that when I am on a Sky Surfing Photo Mission, I will not allow myself the possibility of passing on a shot that I will even remotely later regret not having. It takes a little extra work but I know I did my best to cover the subject in the time allotted. The Sky Surfer’s mount waits patiently for his return. 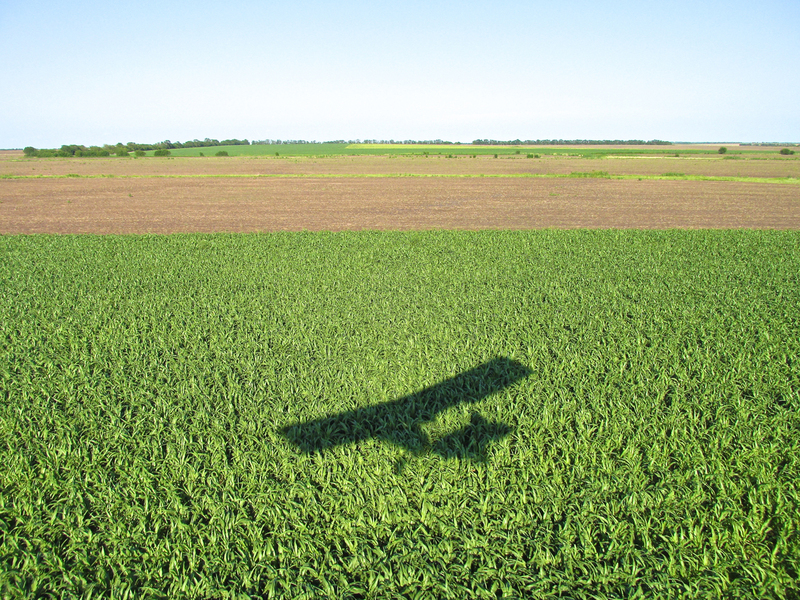 Most of the small town airports I visit have no fuel available on the field. I have to take empty gas containers I keep behind the seat into town and get them filled at a convenience store (gas stations are becoming fewer, too…). The towns that DO have fuel on the airfield ask that you phone the police dispatcher who sends the police out to unlock the gas and take your money (see: Flight to Waynoka). That’s great and works fine. Another method is the self service credit card approach that Anthony and a few other airports use. I had no sooner untied my airplane preparing to roll it over to the gas pump when I saw a substantial Ford SUV roll around the corner heading in my direction. 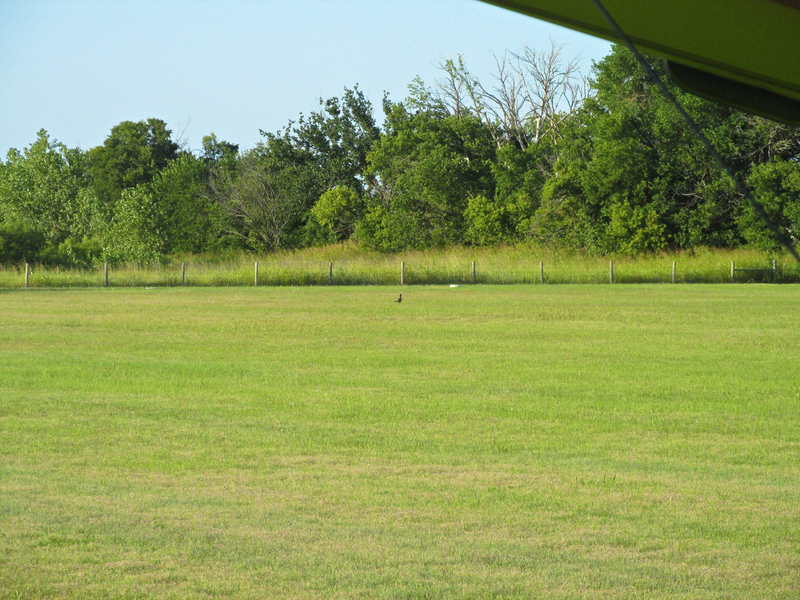 Everywhere I go, people come out to see the bright yellow and orange bird parked at their field so it wasn’t unusual. This time it was Grant Sechler. He introduced himself and said he had seen me in town taking pictures and wondered if I was looking for a house. I told him that while I could think of few places more delightful to live it was not my intent. 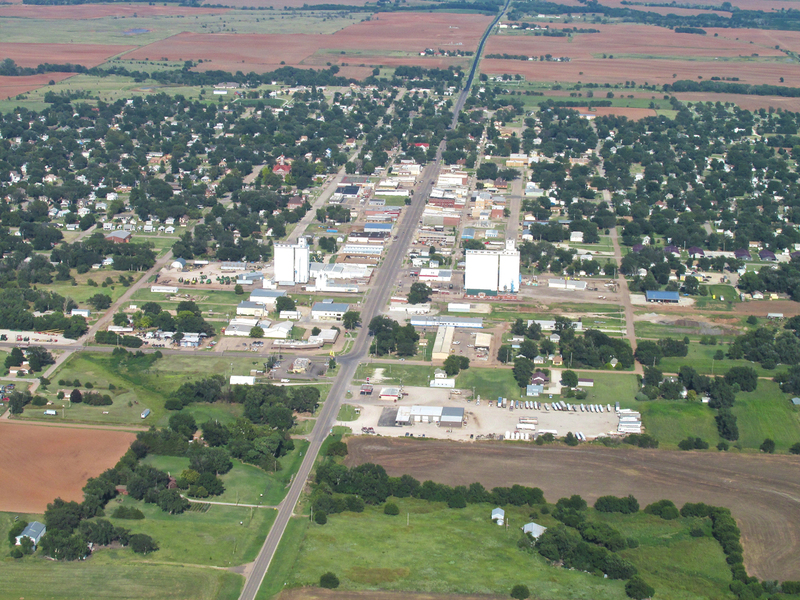 Grant had recently retired from a long stint as Anthony City Superintendent and had lived in Anthony 65 years after moving there at the age of 3 from Wakita. I told him I had been to Wakita once and that the story of the trip was on The Flite Blog™ just as the Anthony Adventure would be as soon as I could get it written. I gave him one of my cards. Then after telling Grant what a fine airport the town has, my appreciation of The Courtesy Car and how much I liked Anthony, I bid farewell. An uneventful flight doesn’t mean a dull flight. It only means there was no mechanical or meteorological anomalies to “steal my joy”. 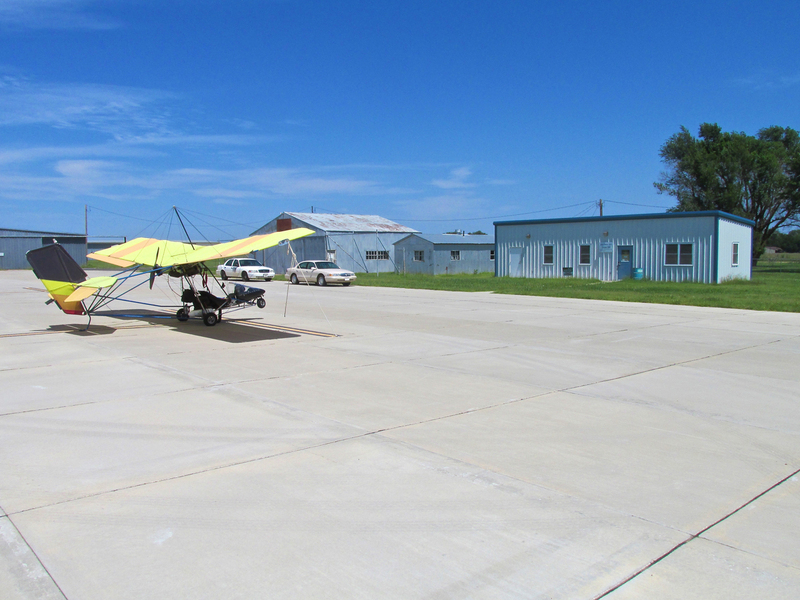 The temperature was a little over 90 with a light wind from the Southwest that would give me a 5-8 mph boost back to Blue Sky Aerodrome. 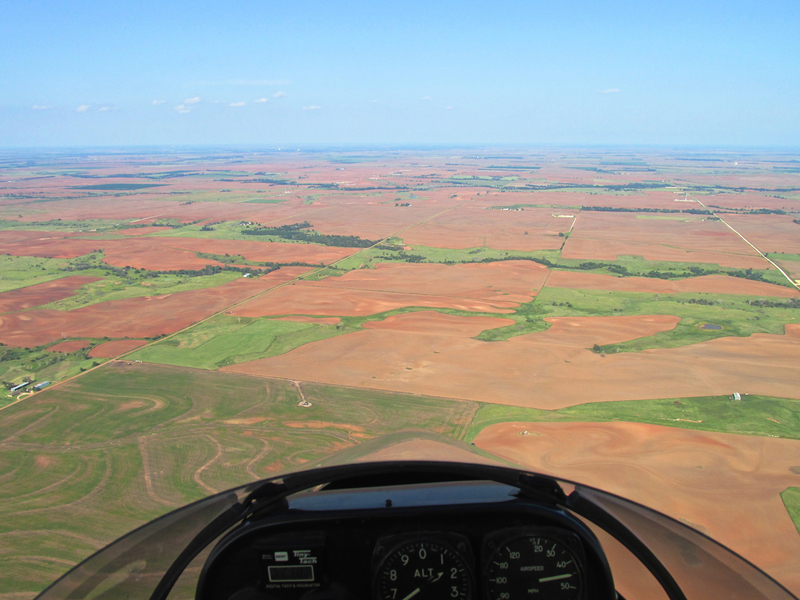 For much of the flight I stayed at 800 to 1,500 feet in order to take advantage of the tailwind. 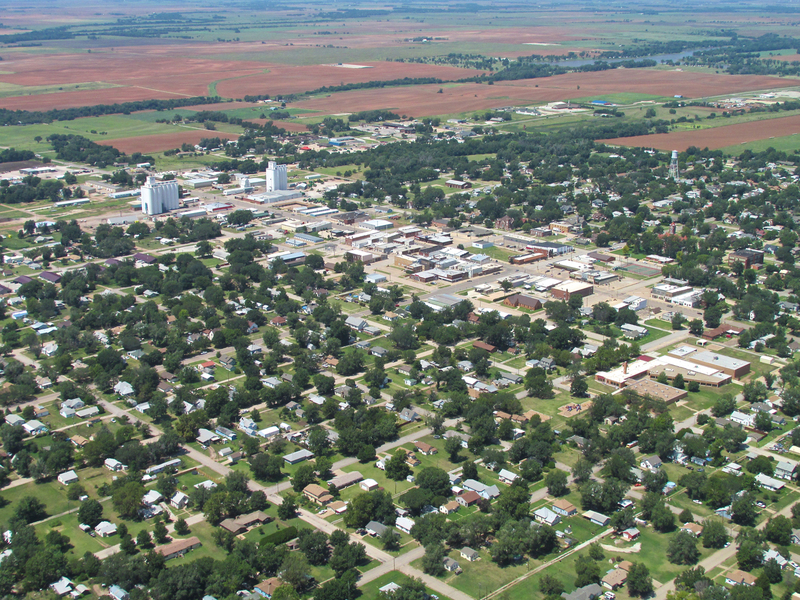 Anthony, Kansas as it is situated on The Great Plains from 2.8 miles West at 300′ AGL just after climbing off the airport runway. 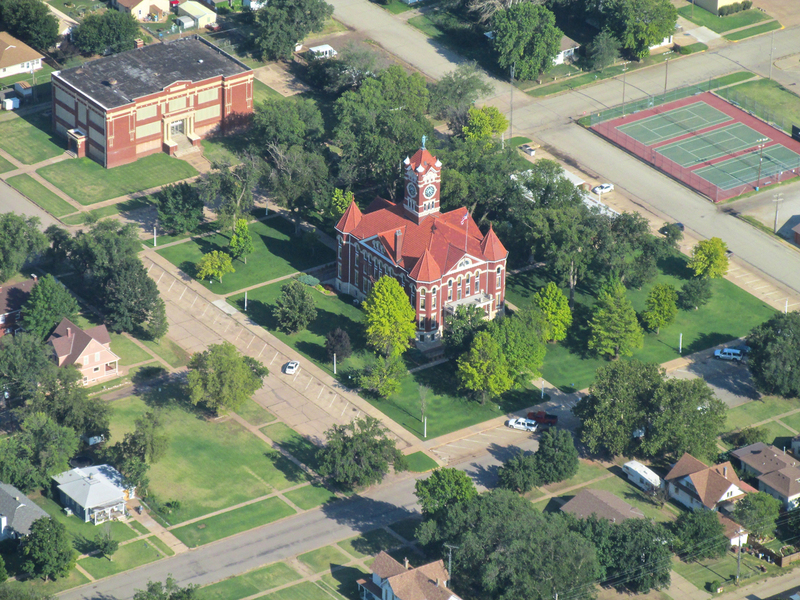 A Telephoto of Anthony from the same position West. 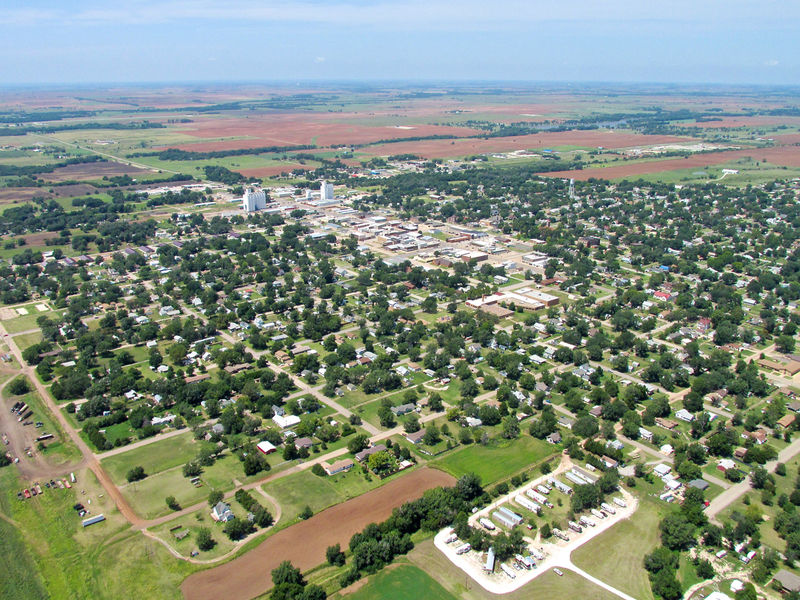 One last aerial of The Heart of Anthony just before I cut across the Northwest corner of town. 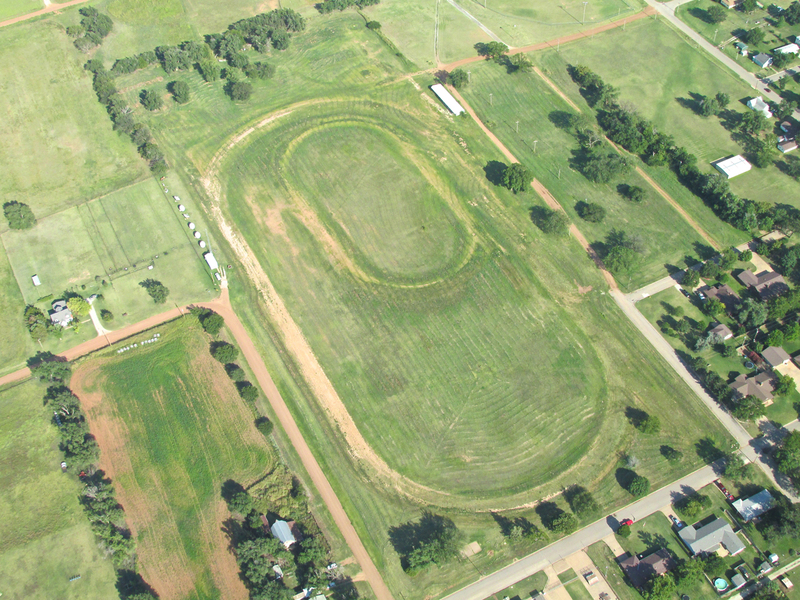 Passing over these ovals in the ground, I realize this is the former Anthony Downs Horse Racing Track on the North side of town. Once I turned Northeast from Anthony, I experienced exceptional lift. I call it “free air” and always allow these manifestations of the Sun’s heat to carry me higher – with a limit. 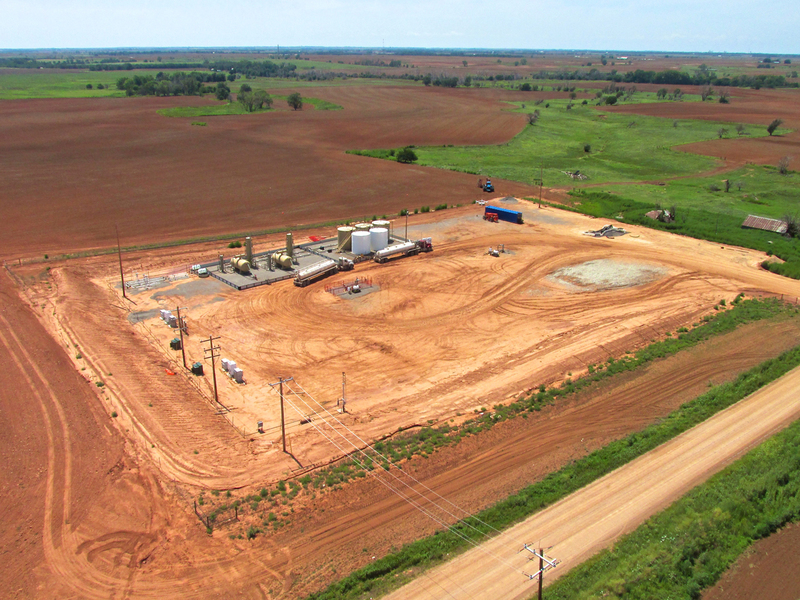 Below you see the view from about 1,500′ AGL. That’s about as high as I like to fly in my Quicksilver MXL. I have been as high as 7,500′ AGL in my old MX but these planes don’t fly very well that high. The engine is normally aspirated and loses power rapidly the higher you go. Also, the wings don’t lift as well at altitude. My slow airspeed makes it seem like I’m standing still. I can’t see details on the ground or wave at people like I can at 300 to 500 feet. I can’t see behind me. #3 is the most significant issue because when you get over 3,000′ AGL you have the remote possibility of meeting a fellow flyer traveling significantly faster. I can see traffic just fine for 270° in front and below me but I’m blind directly behind the airplane and up. While I always have 3 strobe lights flashing when airborne, I prefer not to depend that a guy in a jet overtaking me from behind is going to see me. Even the turbulence from a near miss can break a small plane apart. 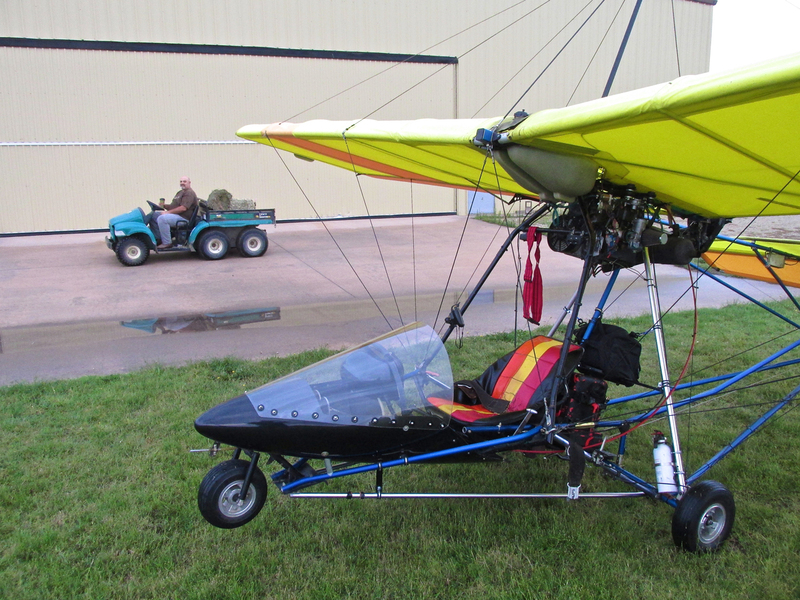 For an Ultralight it’s better to be down lower. An advantage of altitude on the aesthetic side is the painting-like quality the terrain below assumes. 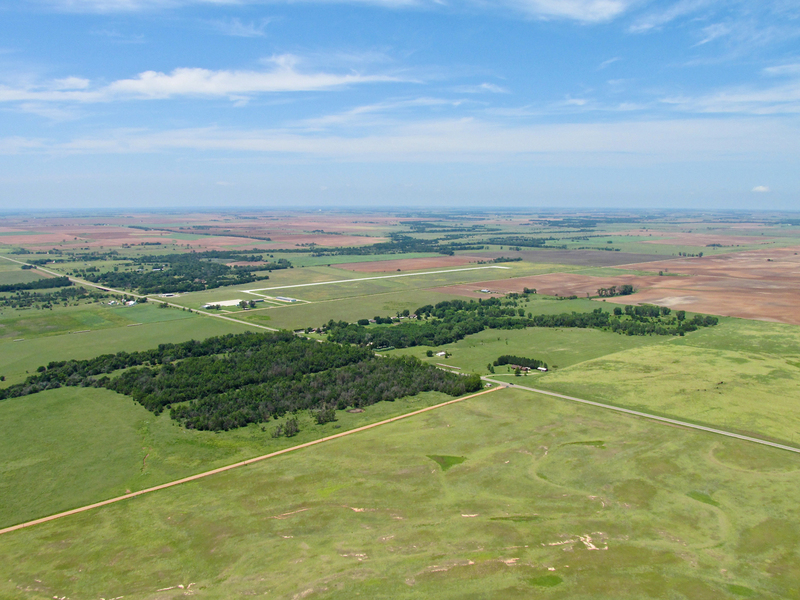 Because of the change in wind and lift we are fortunate to see this area from two flight level perspectives. We saw some of these scenes earlier in the day from 50′ to 300′ AGL and now we can see them from much higher. 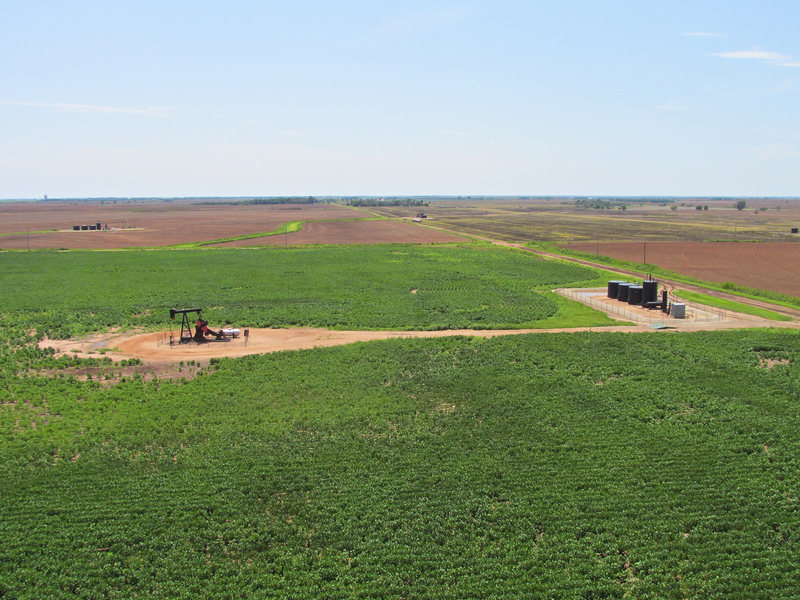 Soon after leaving Anthony, looking Southeast from 1700′ AGL, we see a new exploration bracketed by two completed ones. 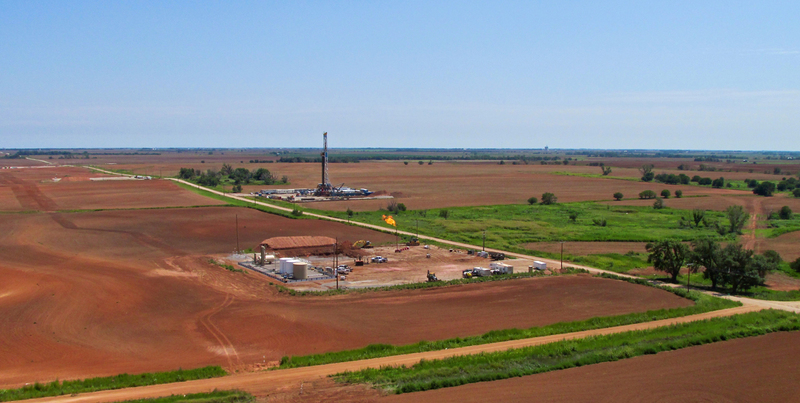 Later, looking Northeast from 1,800′ AGL, three drilling rigs, one gas flare and a completed well lie on this road below. Another fine canvas by The Painter. Earlier that morning I passed this one at about 200′ AGL on the other side. 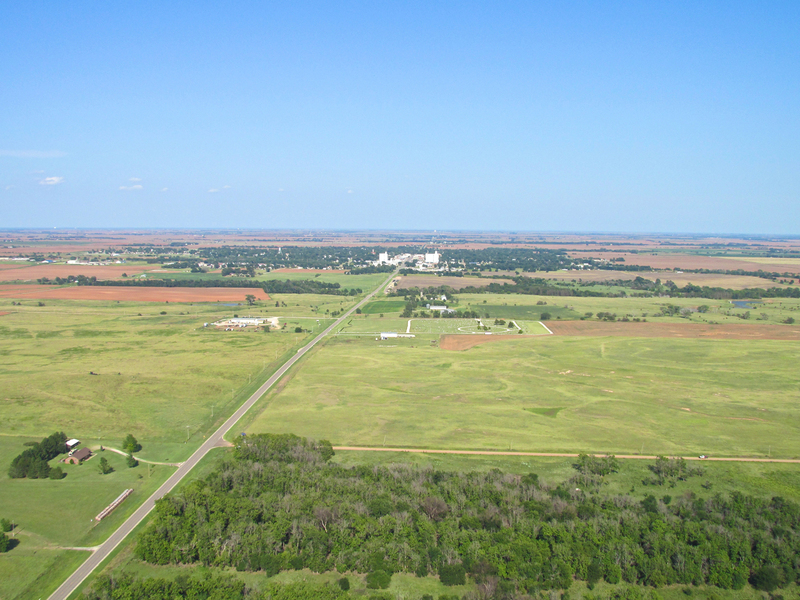 This gives you a higher perspective from the Northwest at about 1,000′ AGL roughly a mile away. 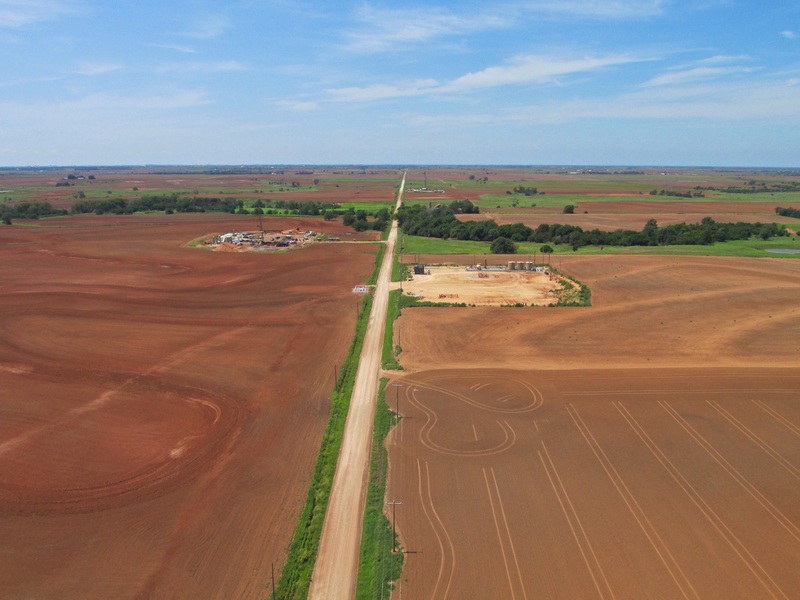 While Kansas has a fine mix of agriculture, oil, aviation manufacturing and various entrepreneurial fast-food ventures, these things are not evenly dispersed. 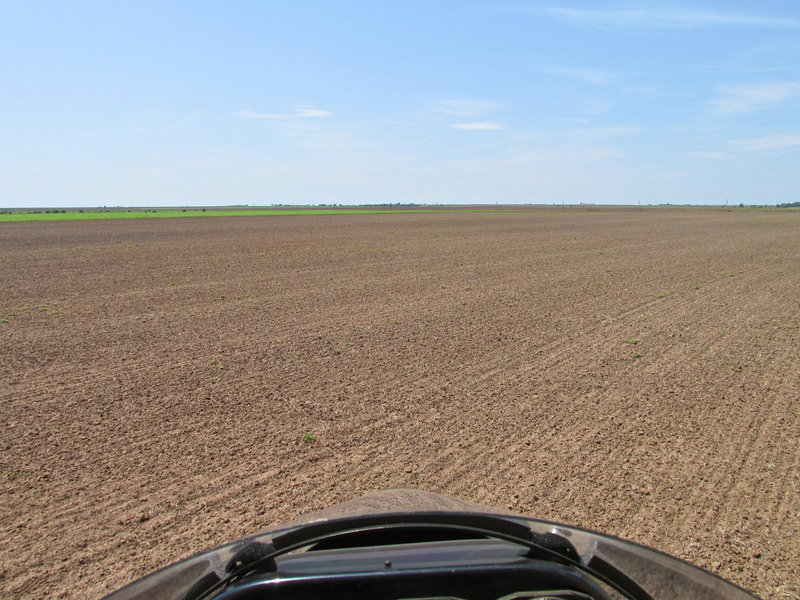 Soon I leave the Oil Patch and am back over a predominantly agriculture area. There will be pump jacks seen frequently, though – The Farmer’s Friend. This is the recipient of my Farmstead of The Day Award. Nothing special here but beauty and grandeur. 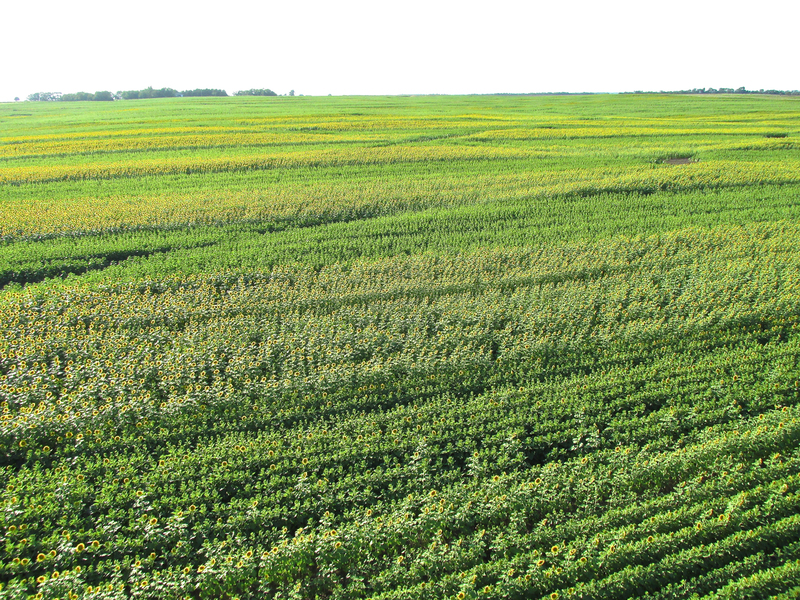 I came in low over this field to discern what this crop was. Once I was this close I could see it is Sunflowers. The heads are mighty small for a commercial crop, though. Evidence of the rain of that morning and days before is quite evident the closer I get to my destination. The Ninnescah River is up near the top of its banks. I was upset at myself for not getting this shot earlier when the road was under water. That really told a story. Now you see why I said earlier that when on a Safari, it is important to capture scenes as I come upon them lest they be lost. At least the house is dry. Once in a while I stumble across this place. 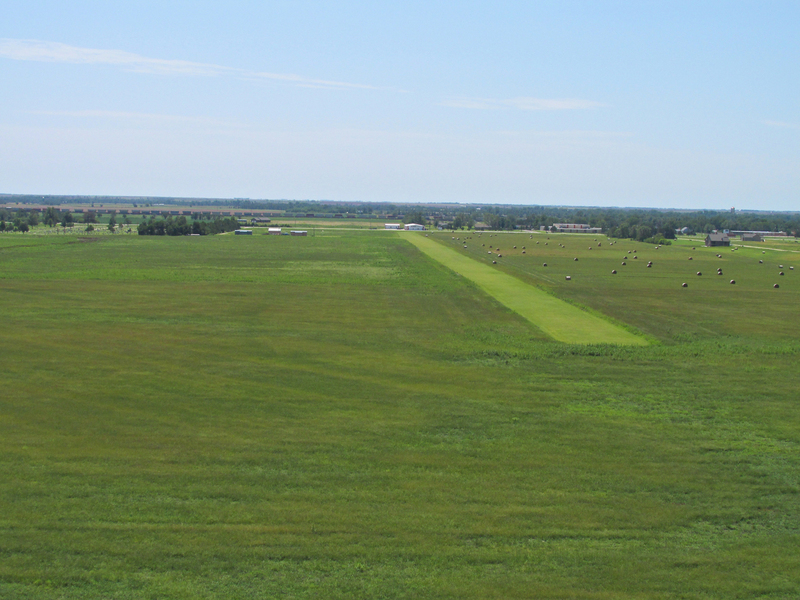 It is the runway of The Chisholm Trail Radio Control Club. It looks like they were close to getting soaked also. Don’t you wish your garden looked half as good as this? I do. 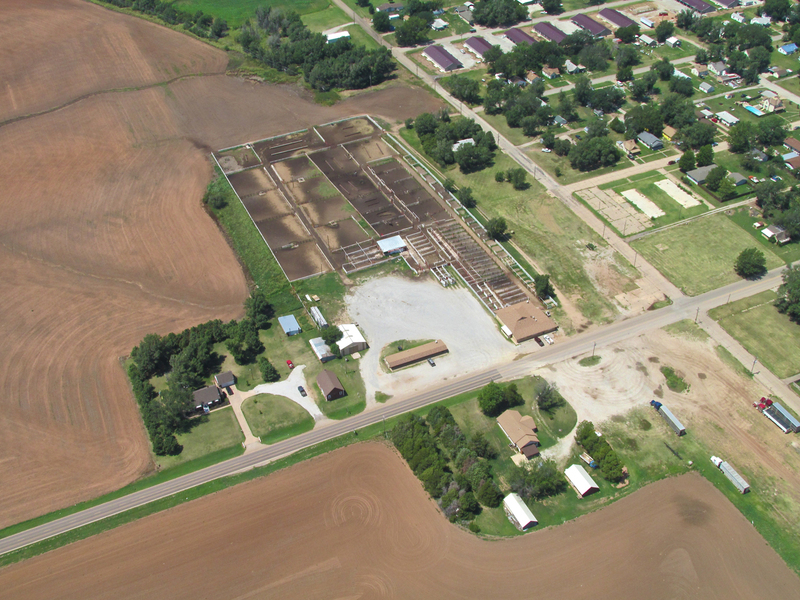 Looking Northeast from 600′ AGL over The Fairfield Polo Club which is Southwest of Blue Sky Aerodrome across I-135 Turnpike. As I taxi to the hangar, Pete zig-zags his way over to greet me. Sometimes a relatively short flight can generate a lot of pictures and a lot of words. So it was with the Flight To Anthony, Kansas. It was a great day. I hope you liked it! A long time since I’ve commented on your flights, but I have read you account of the trip to Anthony and want to congratulate you on another fine piece. As I believe I have noted before, you have a wonderful talent on the making the ordinary seem special. Absolutely great photos! Good to hear from you and I’m glad you liked it. 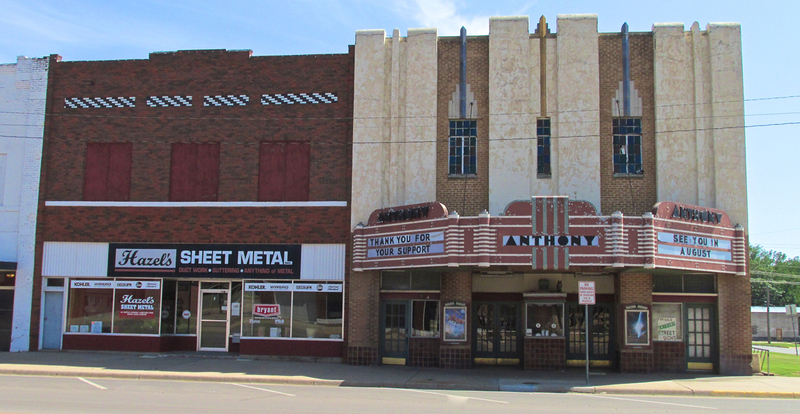 Anthony is another of the hundred or so small towns on The Great Plains I find charming and interesting. Maybe I’ll catch you at a Fly-In during Season 2015! Don’t forget, I’m always up for another fine story from you, too, when you get one ready. Hey! Check out “The Harper Run” on my YouTube Channel – 6 Cameras on my Quicksilver. I think you will like it.